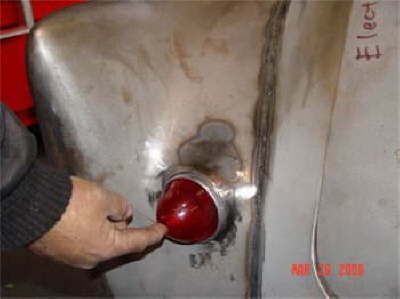 fitting new taillight rings with 58 chev lenses. 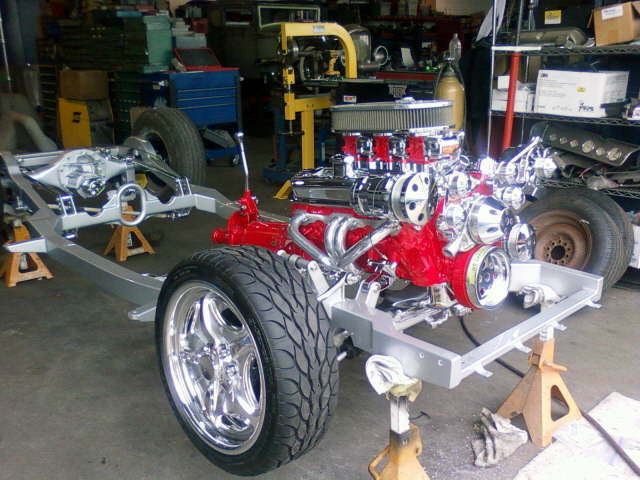 Latest 4 pics. 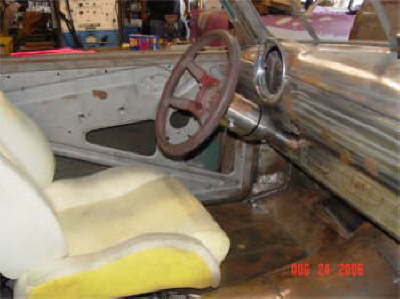 Dash completed and installed. 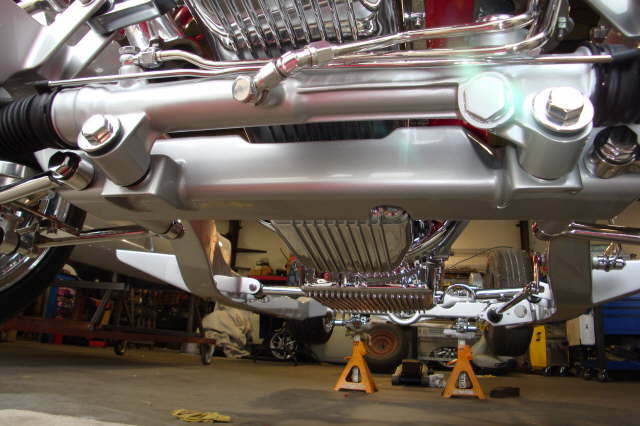 Air ride suspension going in. 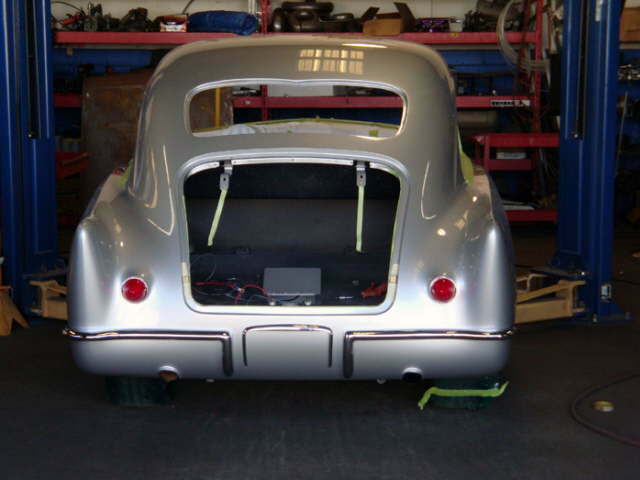 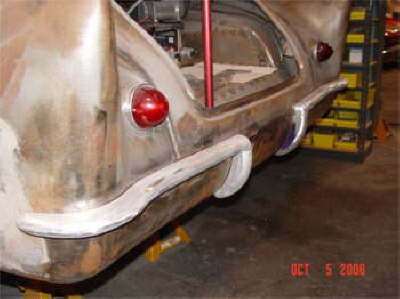 Tail light work almost complete, left light area re-shaped and right light area not done yet. 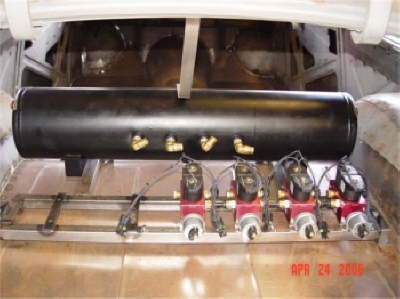 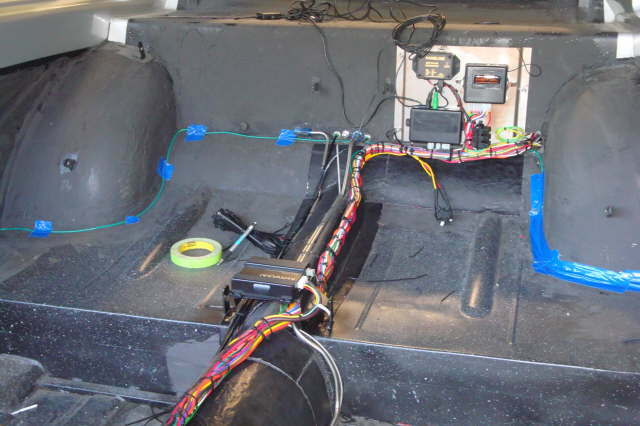 air ride technologies system being installed. 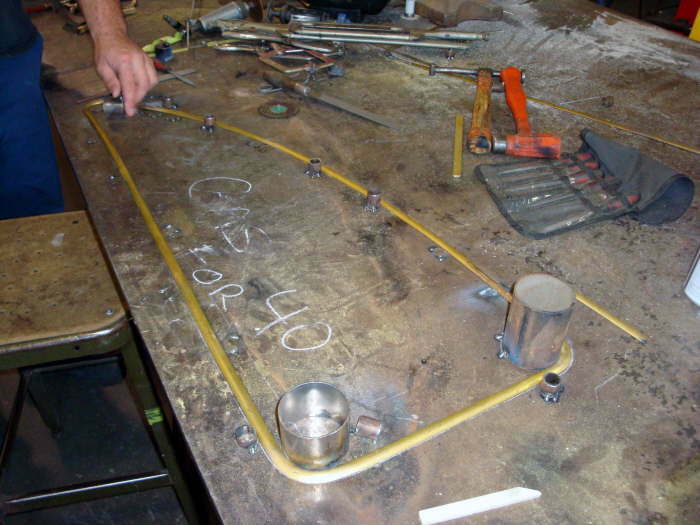 fabricating new grille center piece. 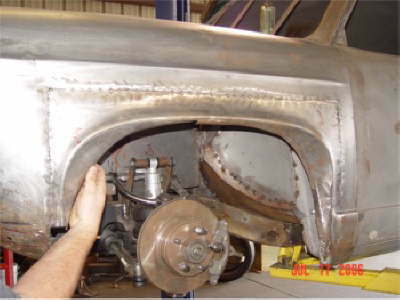 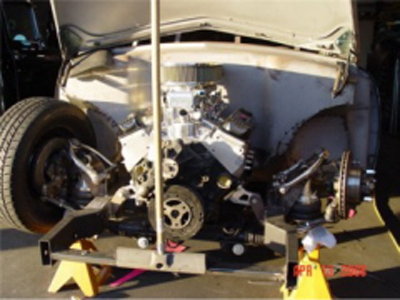 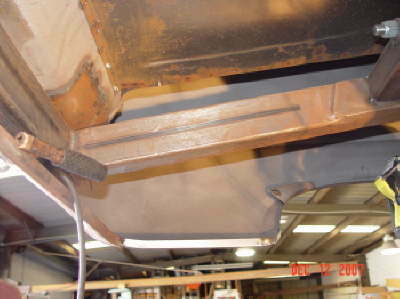 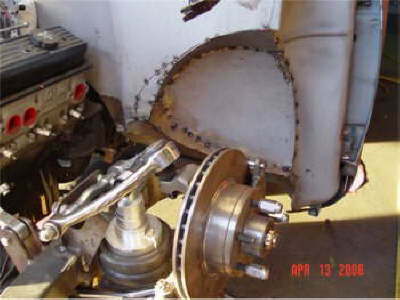 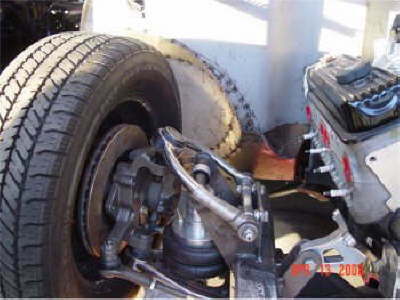 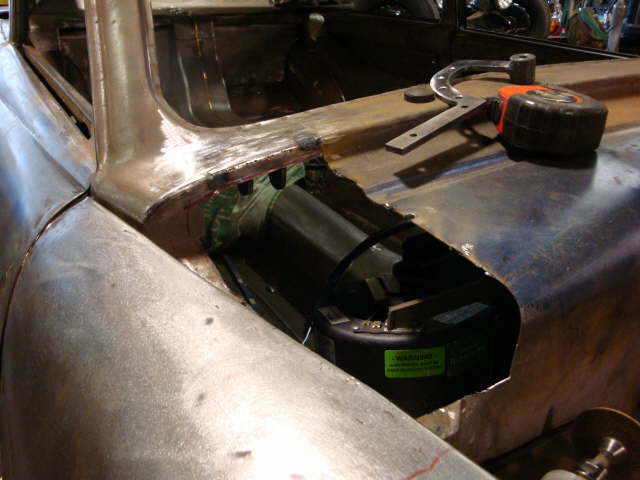 Here are two shots of inner fenders being made to accommodate the AC compressor and the alternator. 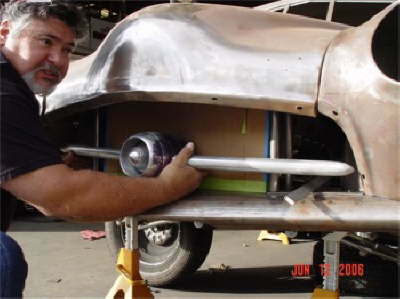 All Body modifications are getting close to being completed. 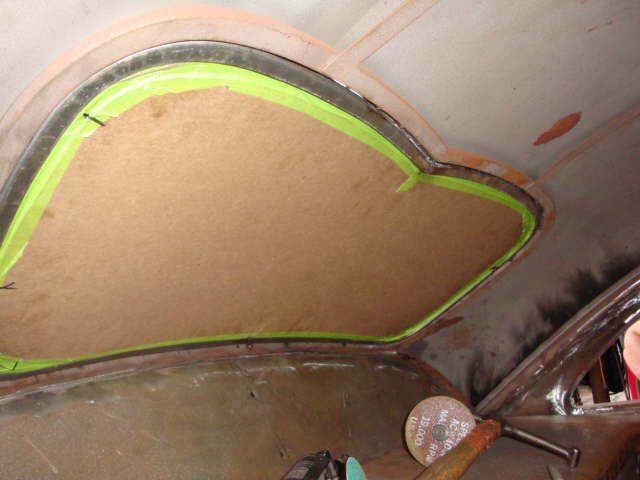 Here are two shots of inner fenders being made to accommodate the AC compressor and the alternator. 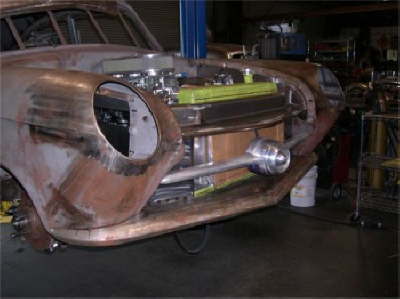 All Body modifications are getting close to being completed. 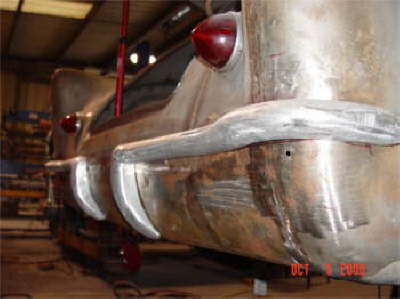 a couple shots of each side of the front fenders. 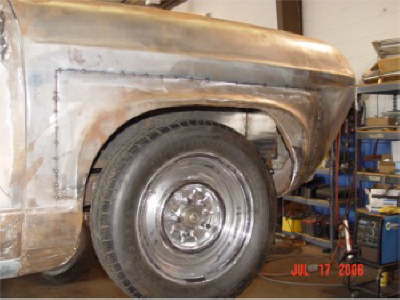 We raised the wheel openings just 1” higher that original but it makes a lot of difference in the turning radius with the air ride suspension. 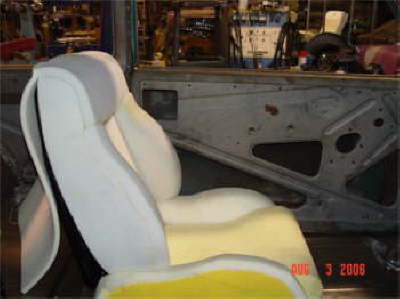 Front bucket seats from glide engineering arrived. 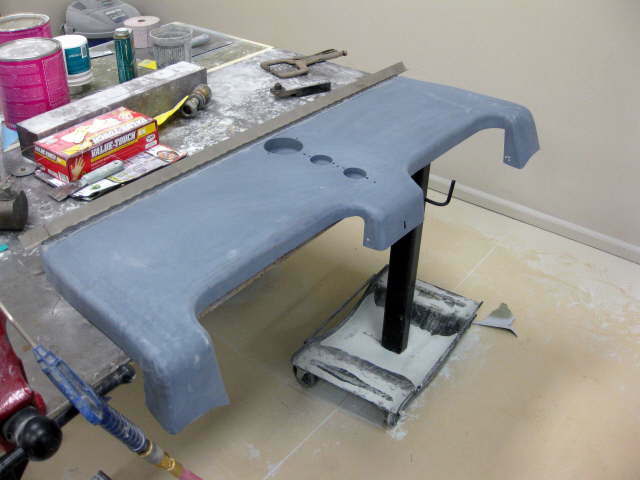 Seats from Glide Engineering arrived and are being dry fit. 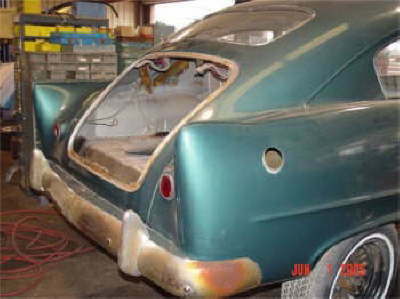 Here are a few latest pics of what has been going on. 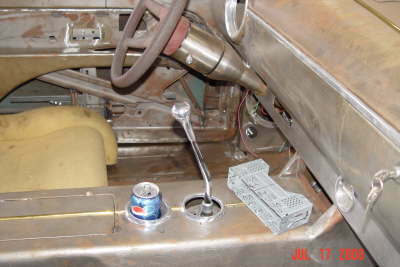 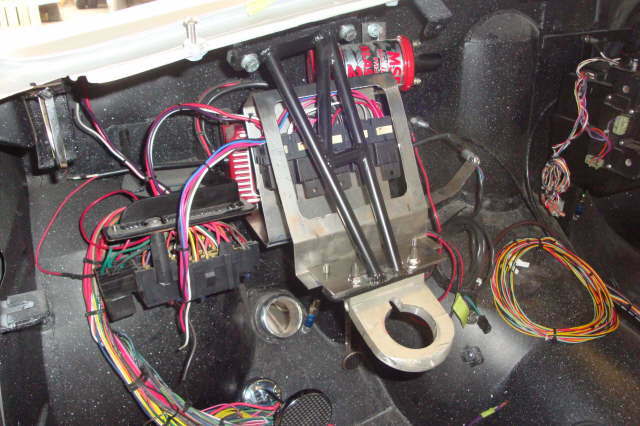 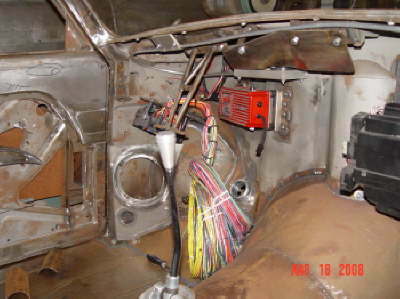 Dash work and steering column installation. 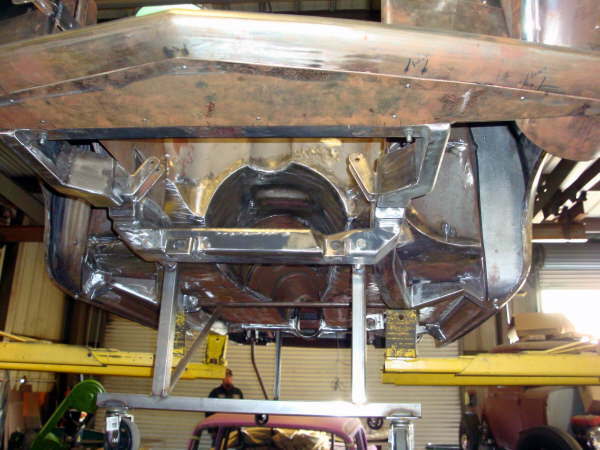 Here are a few shots of the rear bumpers being made from aluminum then will be chrome plated. 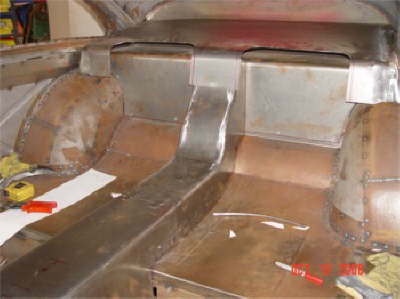 Here is a few shots of work that has been started on the console rear seating area. 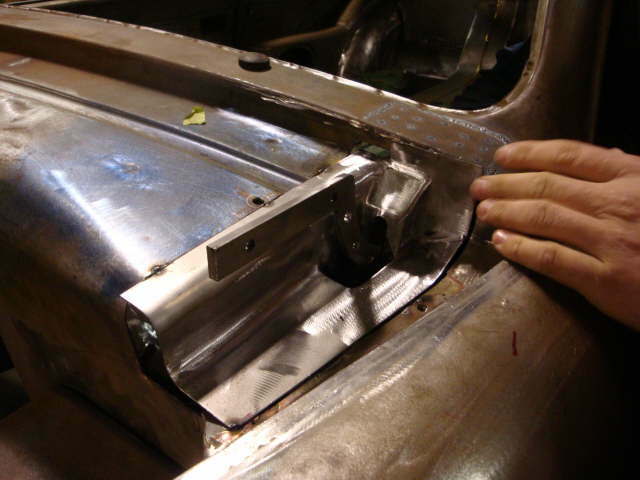 Still in the design process, just trial and error to see what works. 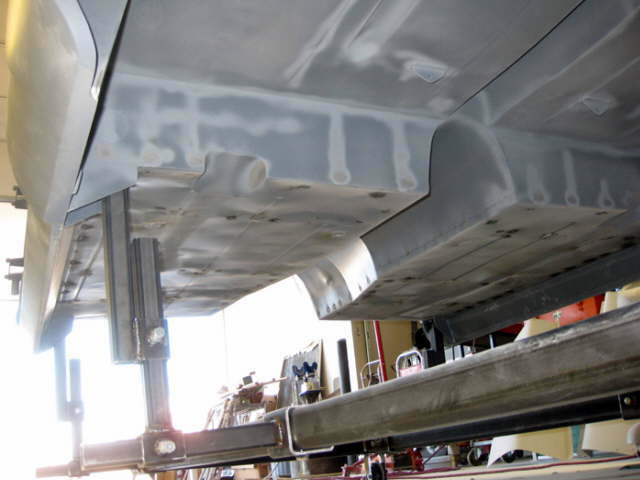 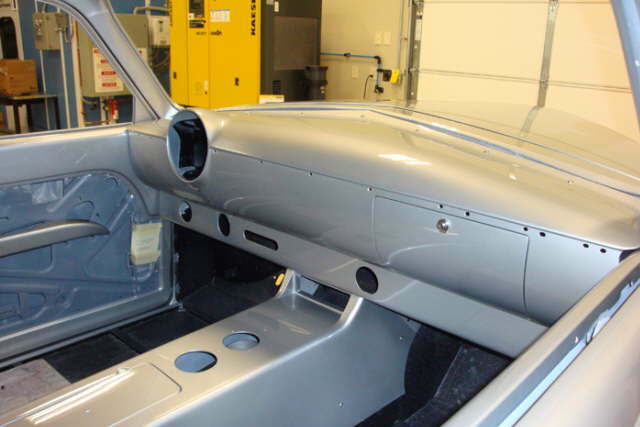 The rocker panels are being set in to allow for the door bottoms to be lengthened down to the bottom of the rocker panels to eliminate the horizontal line that would normally be at the bottom of each door. 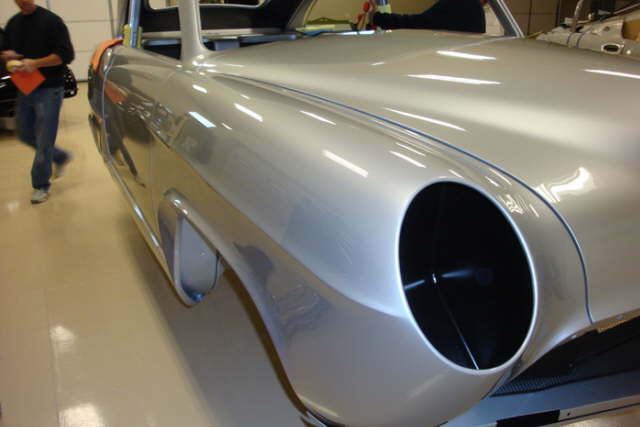 It takes away that horizontal line and looks a lot cleaner. 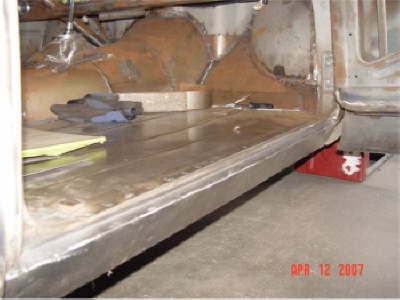 Here are a couple more shots of the concealed rocker panels. 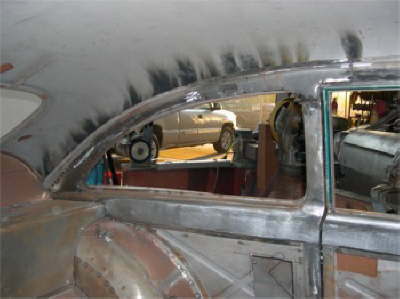 This side is almost complete, and the horizontal line is gone. 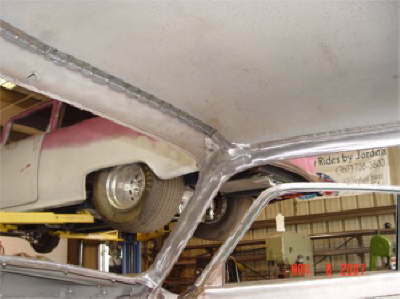 Just a couple shots of the work being done to close up the gaps between the hood and the front fenders. 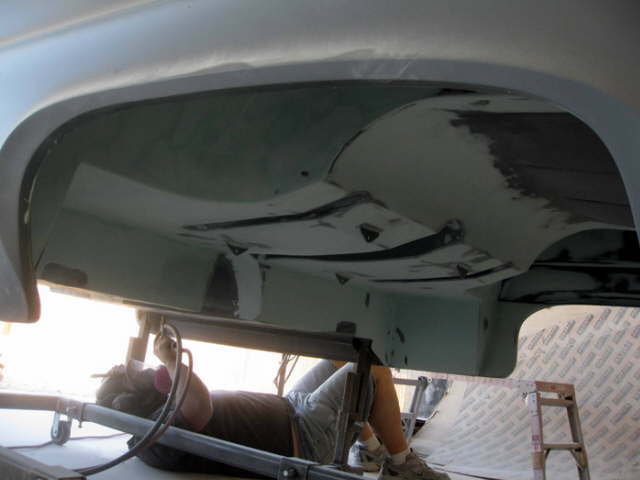 A lot more work than it looks like in the pictures. 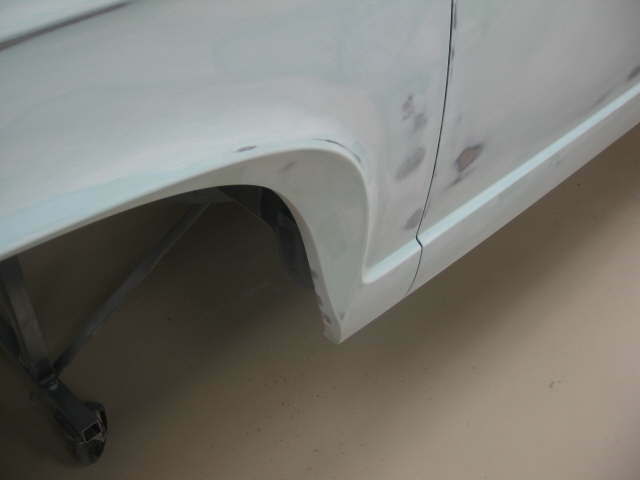 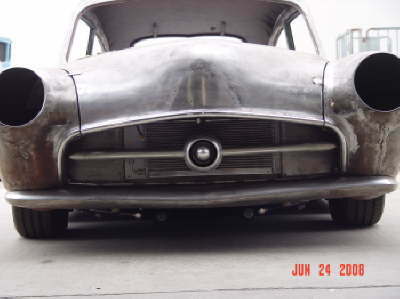 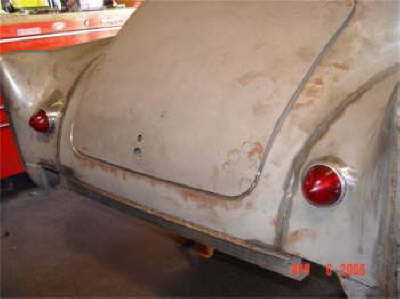 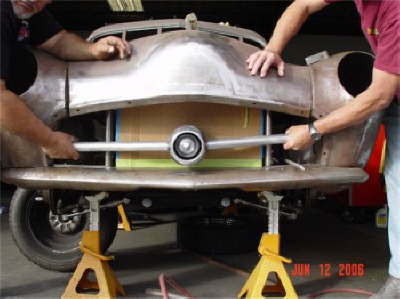 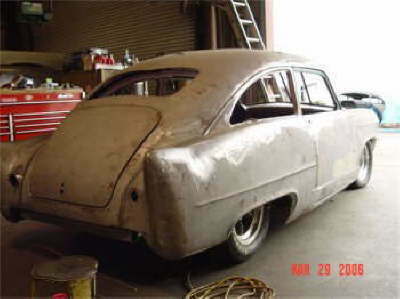 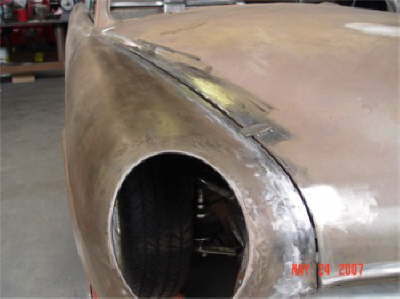 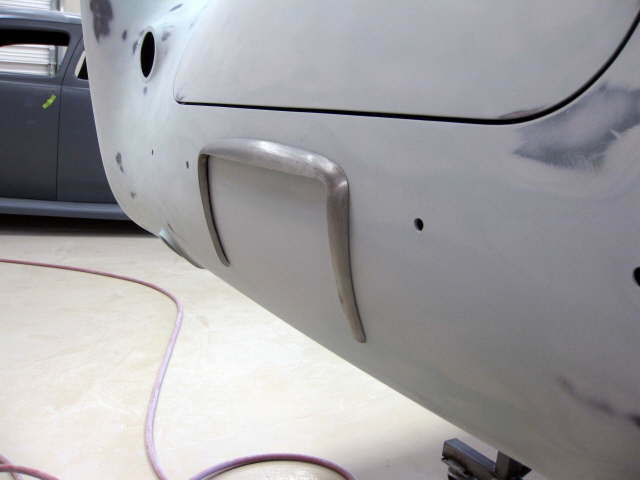 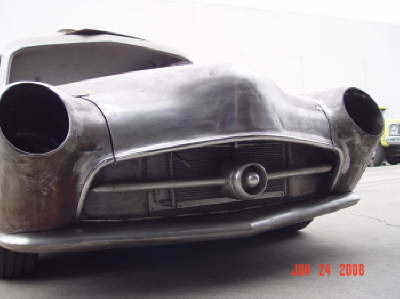 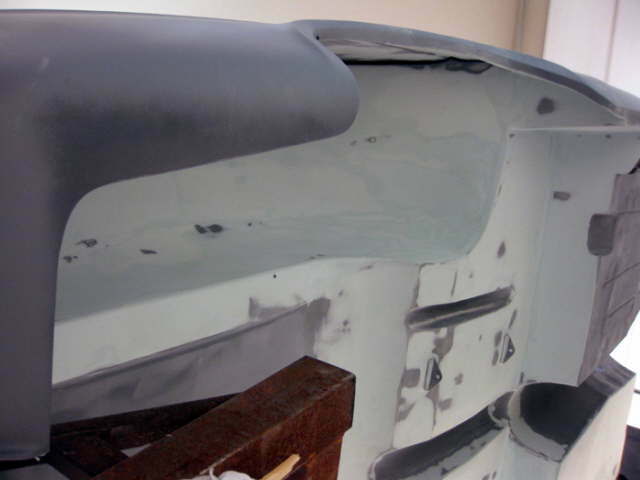 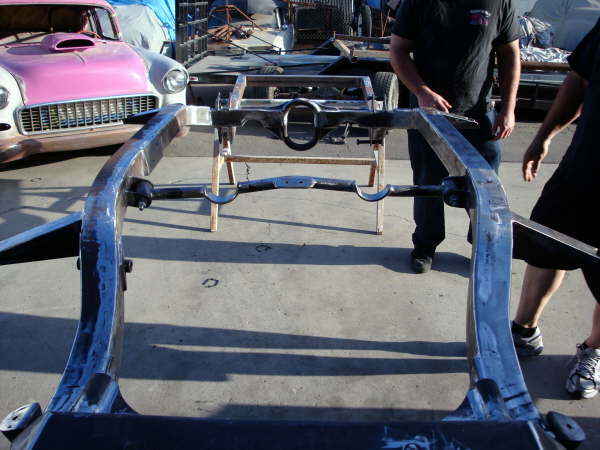 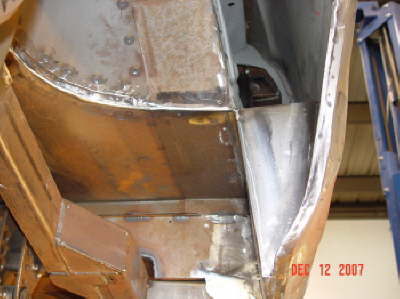 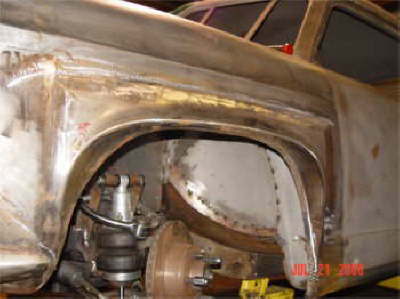 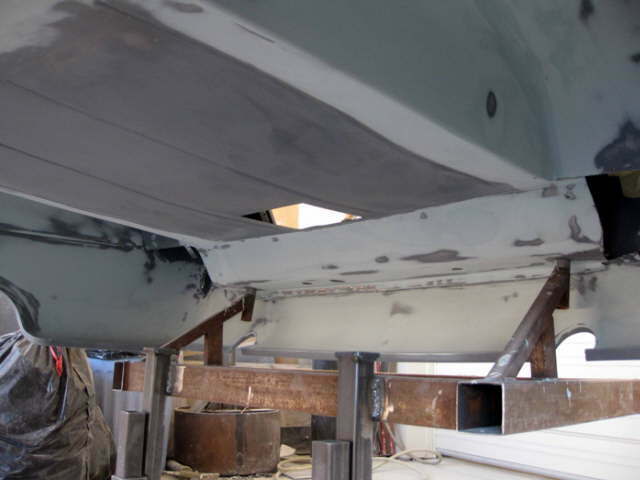 Both fenders had to be pie cut along the hood and metal added to them to make the gaps more uniform. 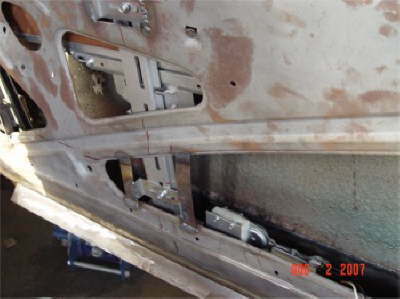 Here are some pics of the new Hagan door hinges installed. 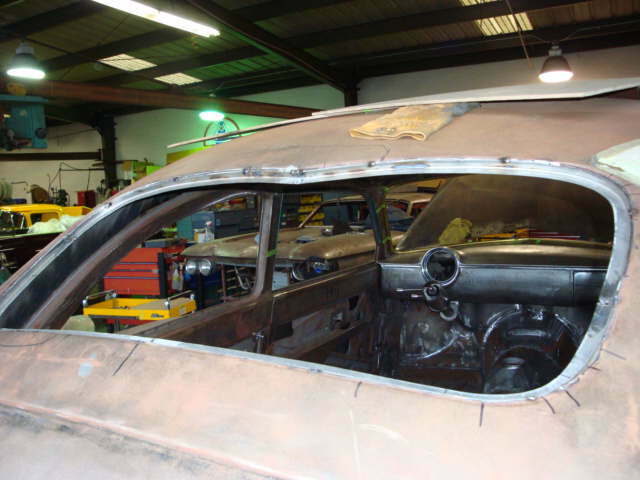 Here are pics of some of the interior work that is being done. 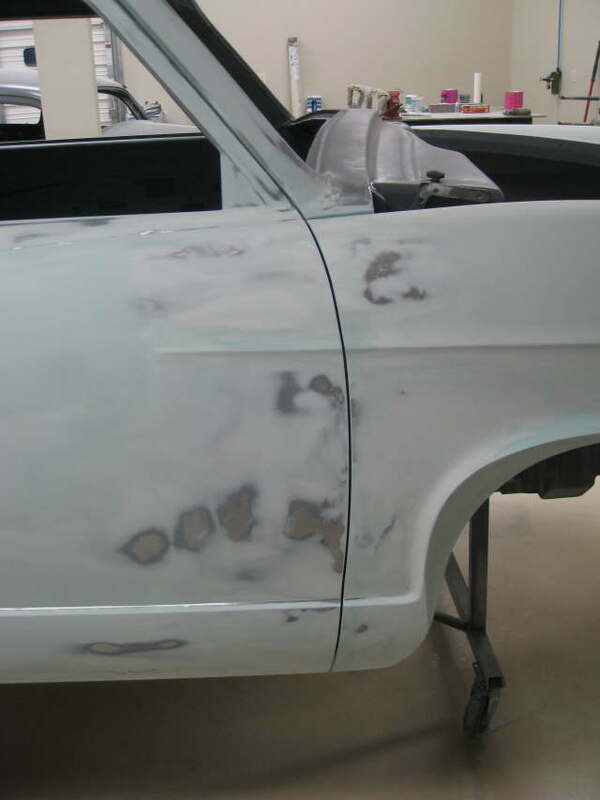 This is a lot of work but the results will be more than worth it. 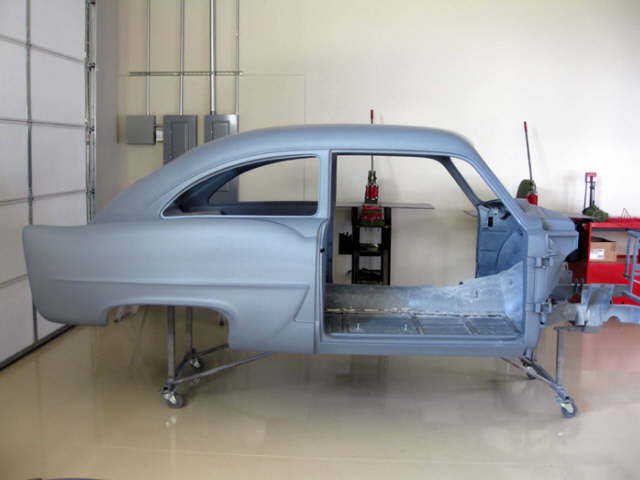 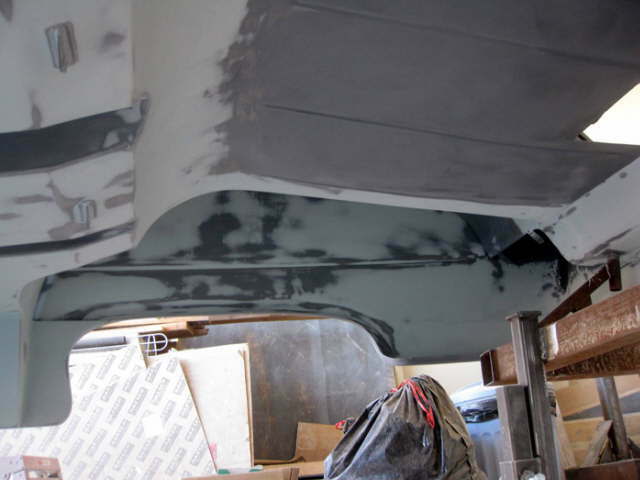 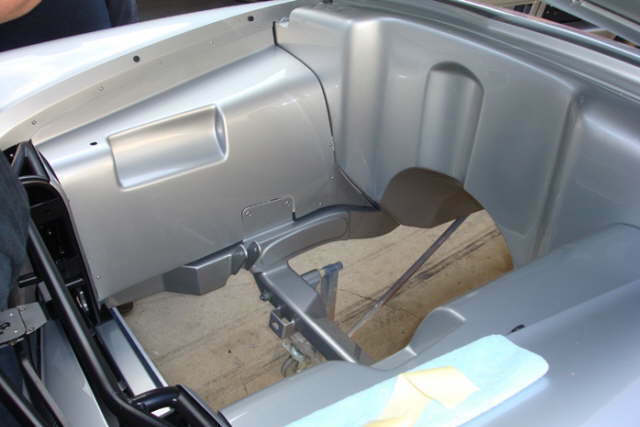 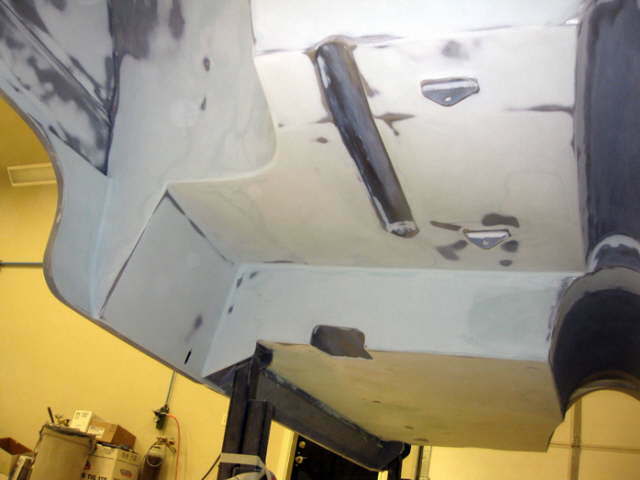 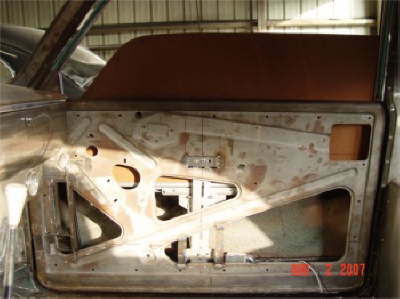 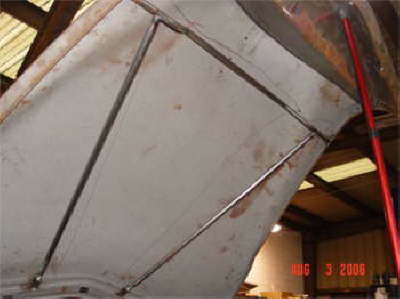 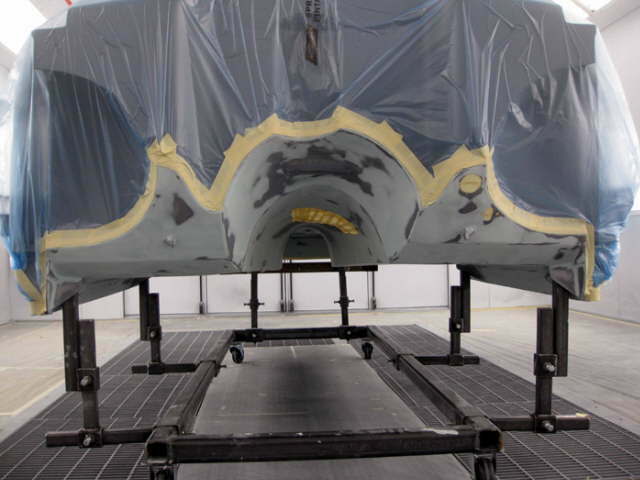 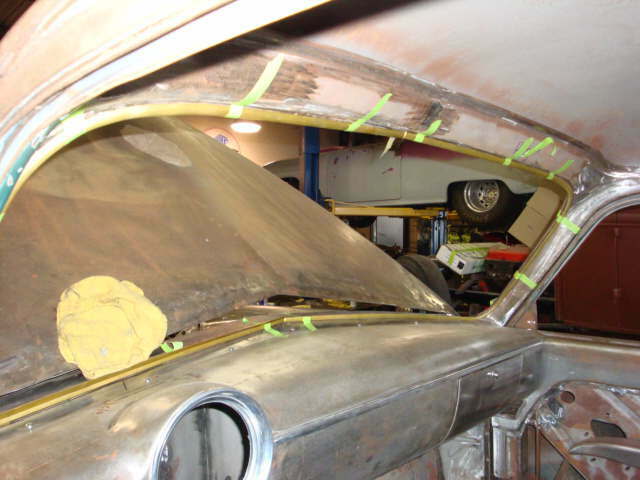 The door panels and roof lines are being re-worked to receive paint in some areas and provide a place for headliner and door panel upholstery to terminate at others. 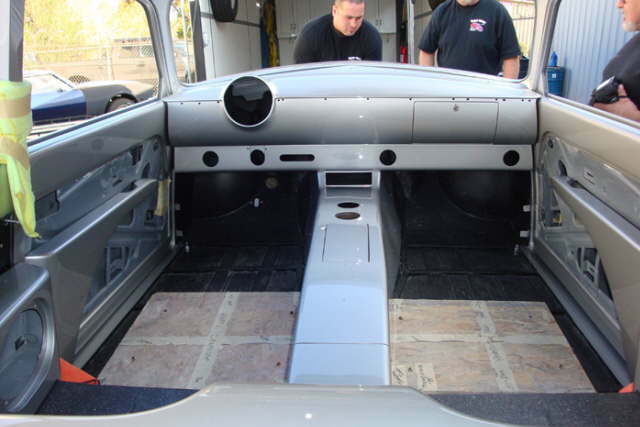 Here are 4 more pics of some of the interior modifications taking place. 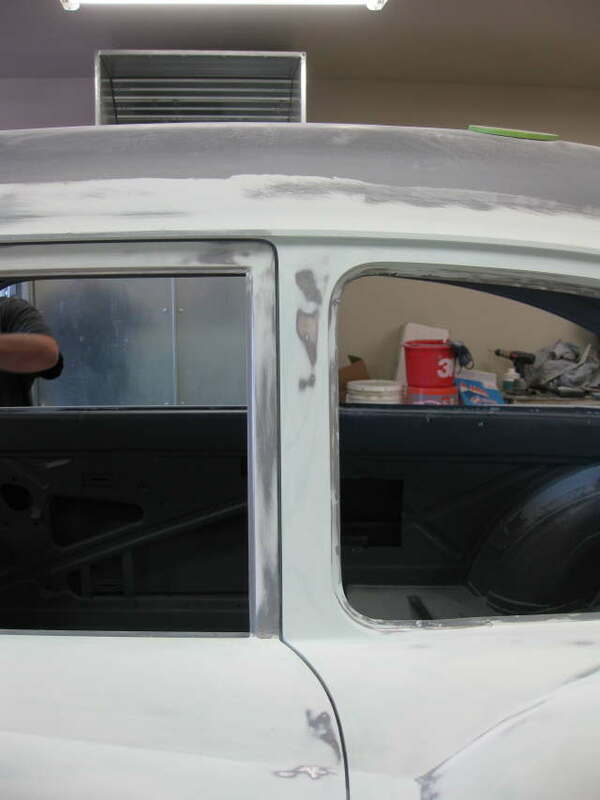 It may not look like a lot of work but it takes a lot of time to fill in and smooth out all the lines inside around the windows and doors to make everything flow together. 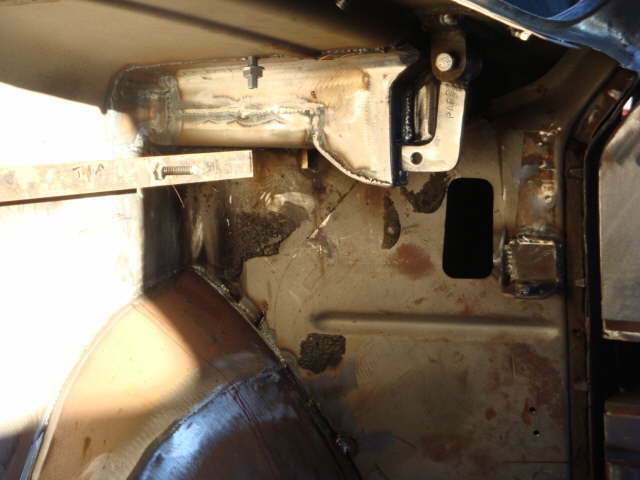 Here are 4 pics of some of the clean up work going on under the rear area of the car at the wheel wells and rear roll pan. 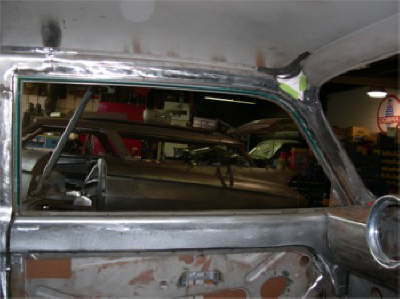 a passenger side shot also. 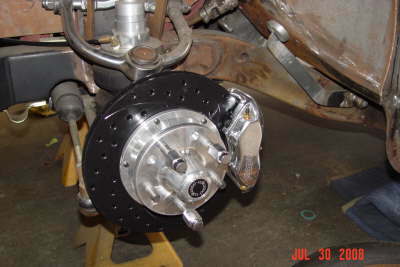 A few pics of recent work: Front rotors and brakes. 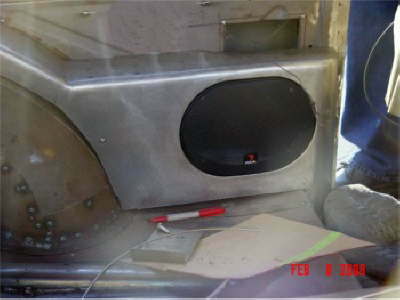 Working toward a completion date of early 2009.
and the most important one the cup holder. 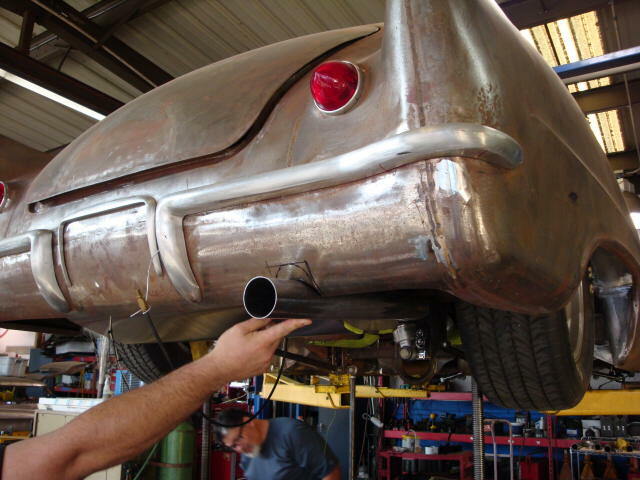 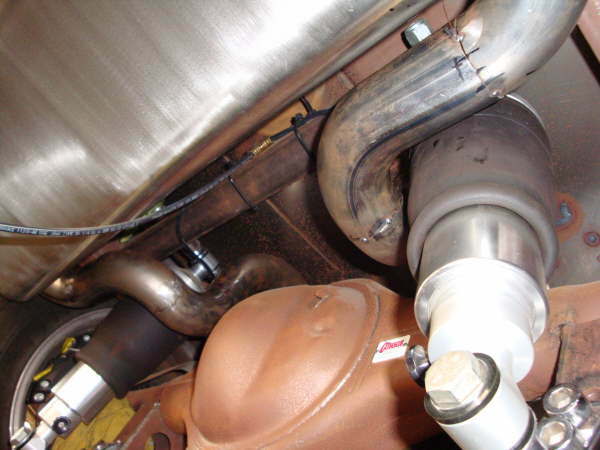 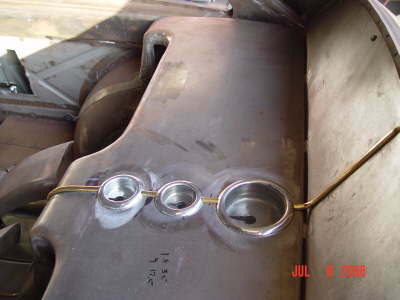 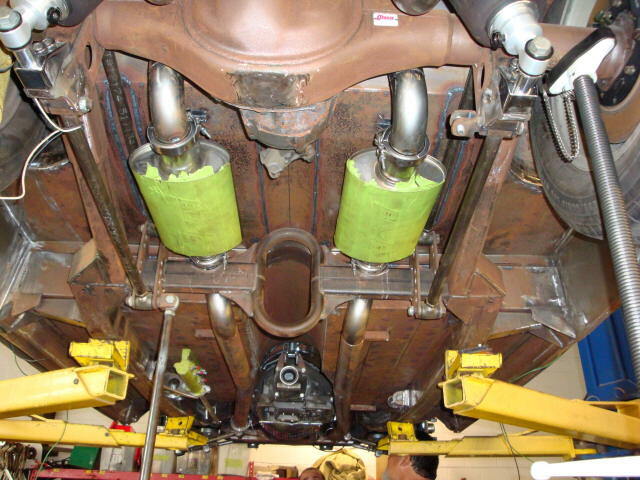 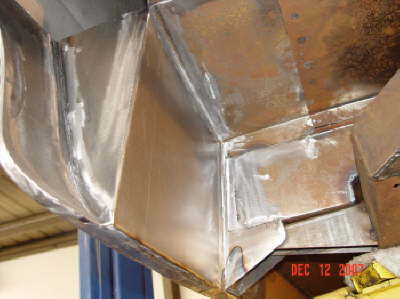 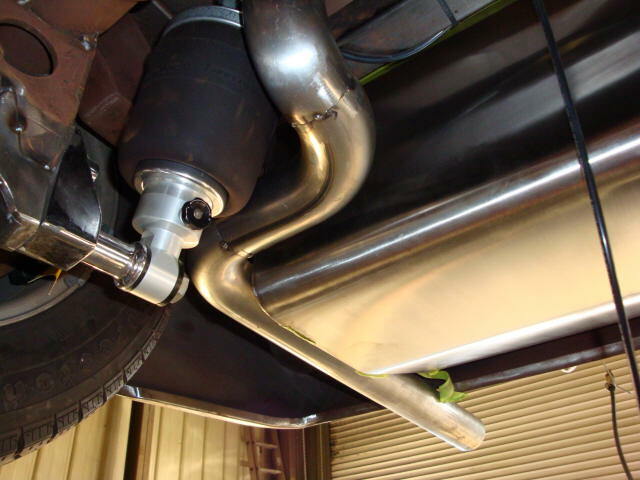 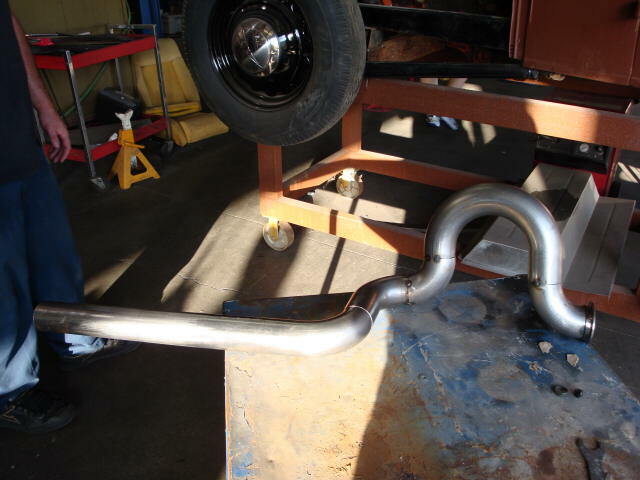 Here are some pics of the exhaust work being done. 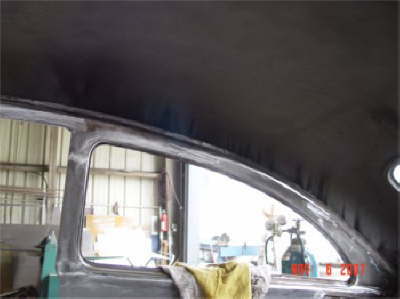 A lot harder that it might look in these shots. 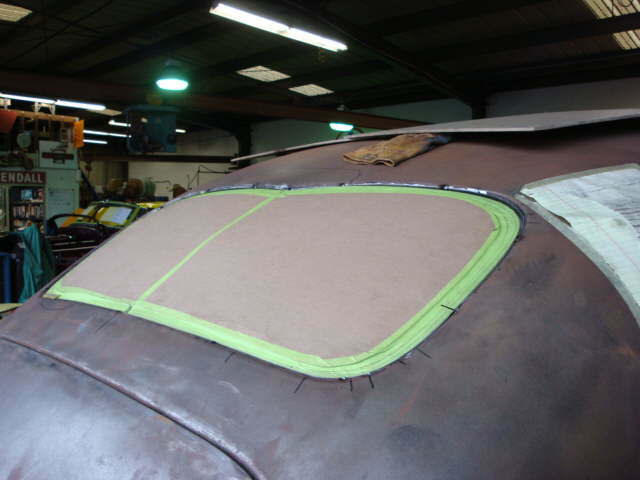 I stopped by the car this morning and took a few shots of the trim being made to go around both the inside and outside of the rear side windows. 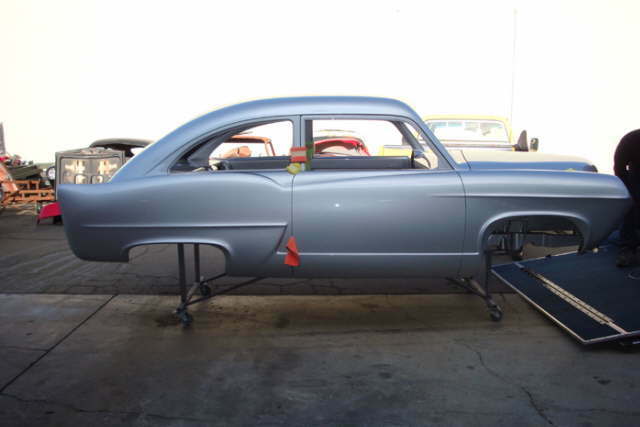 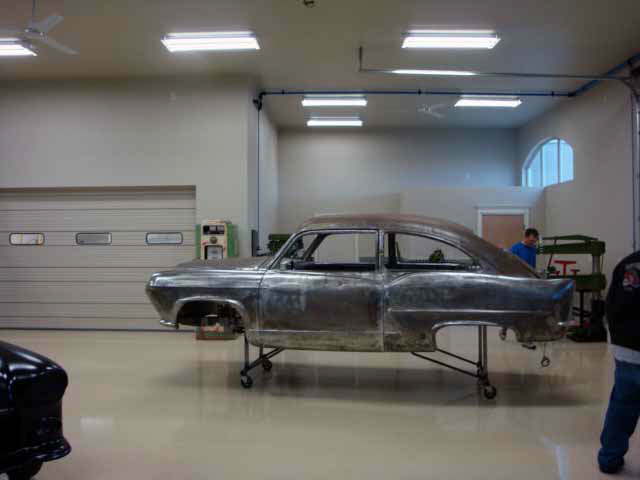 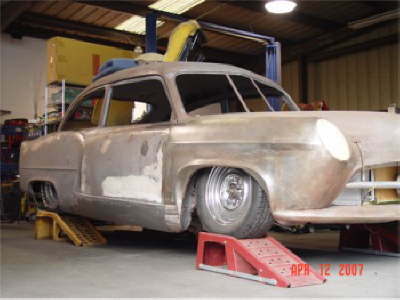 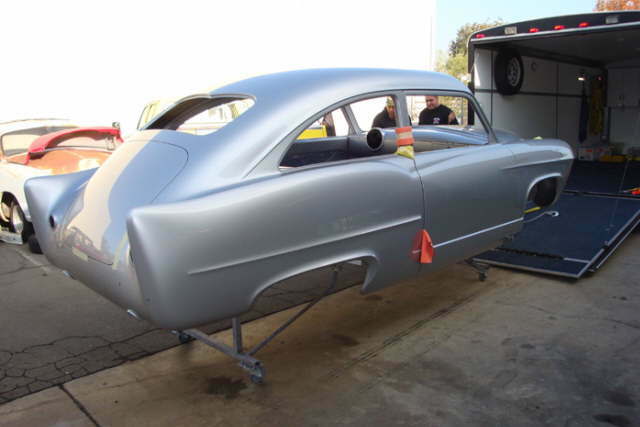 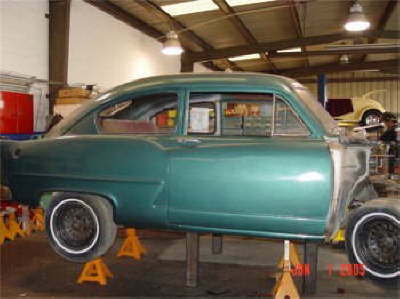 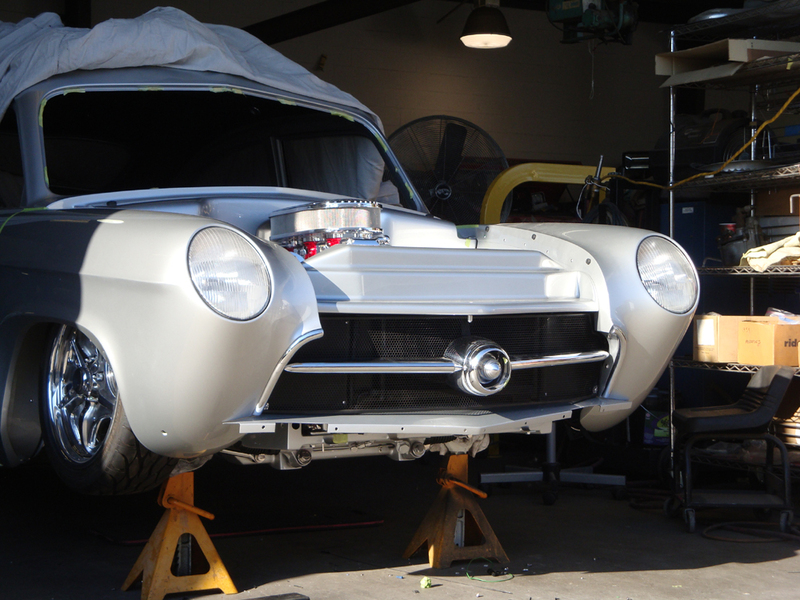 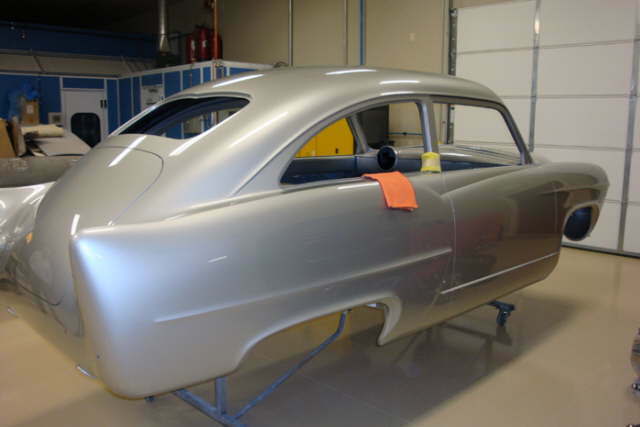 It will be chrome plated when complete and will match the original chrome trim around the front and back windows. 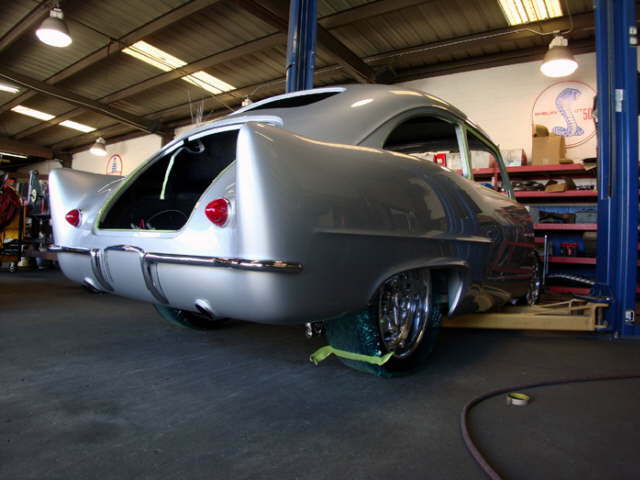 One off wheels by Evod Industries have arrived. 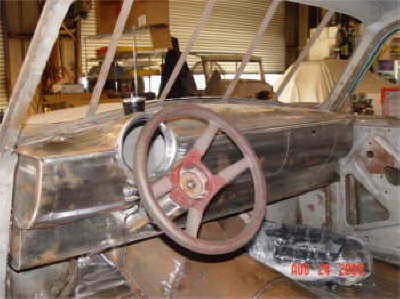 Here are some recent pics of the work being done. 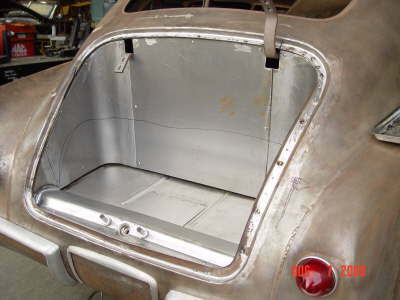 The original hood hinges just weren’t substantial enough to prevent any side to side movement of the hood when opening or closing. 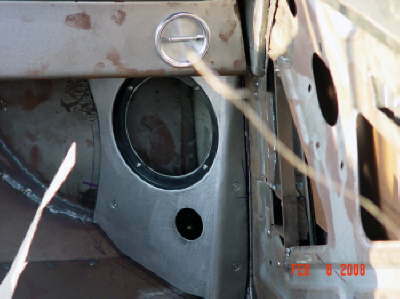 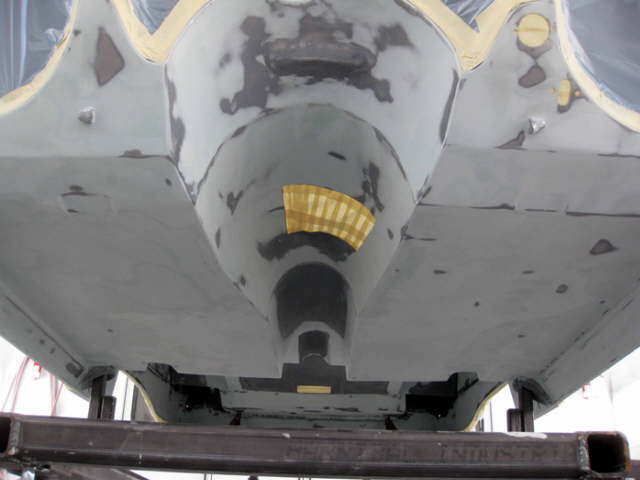 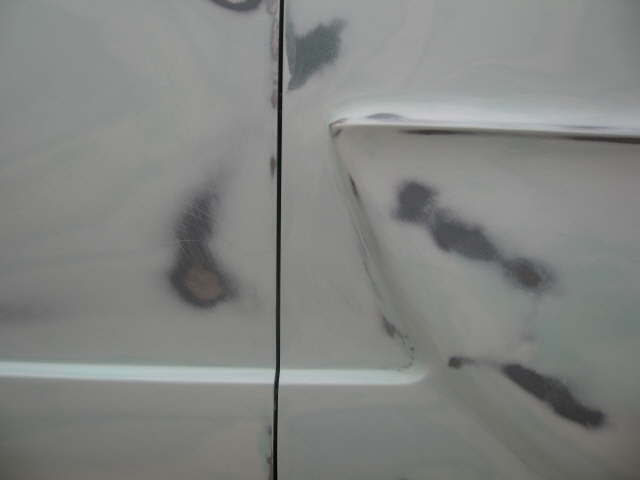 The decision was made to make new ones which would be sufficient enough to prevent any paint damage etc. 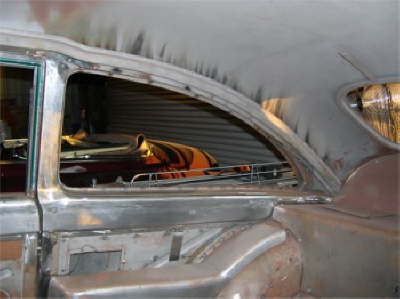 when opening and closing the hood. 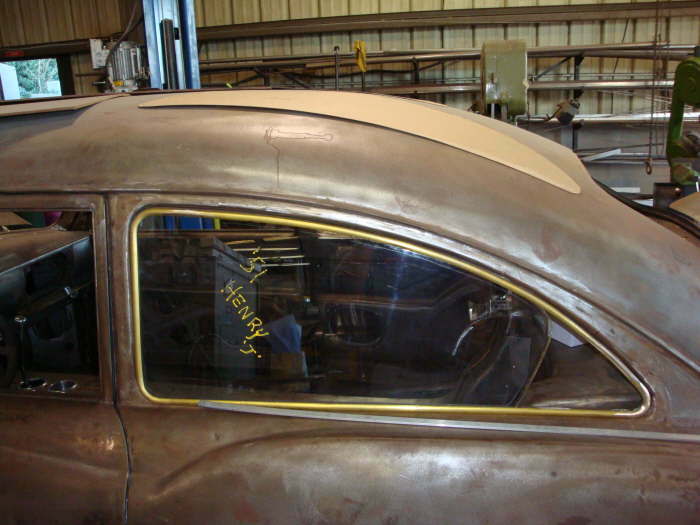 and the front windshield inside and outside brass trim that will be chromed. 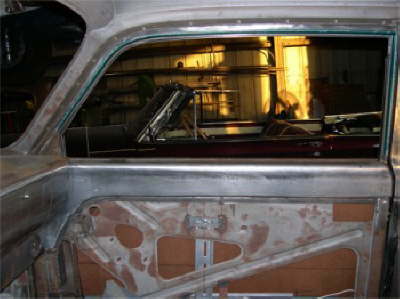 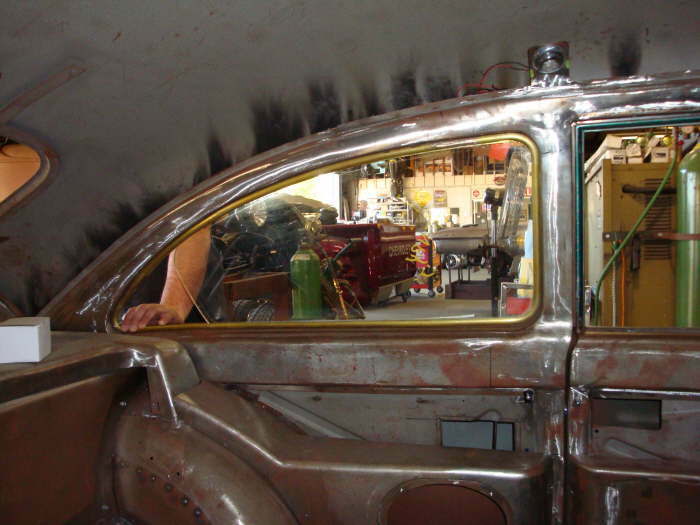 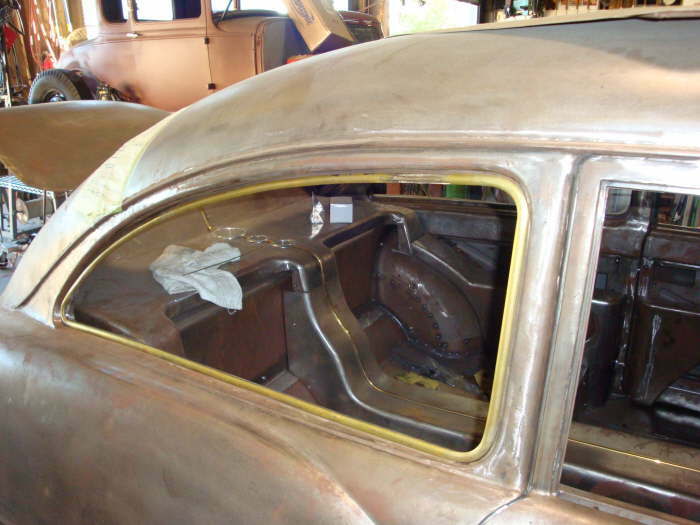 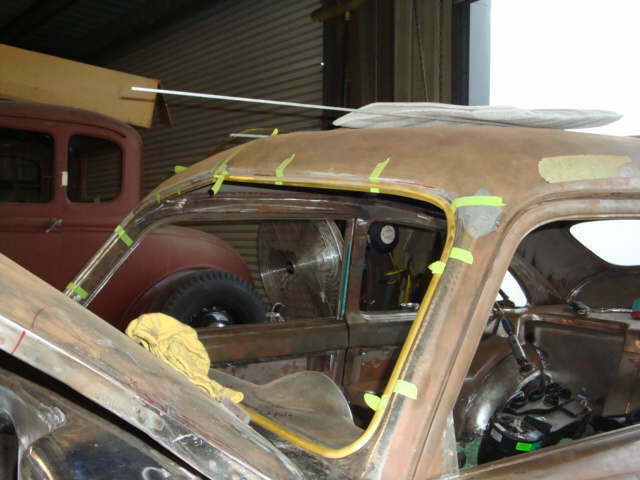 All windows in the car will have the chromed brass trim like the windshield Just couldn’t handle the look of the big fat rubber weatherstrip around all of the glass so it is gone. 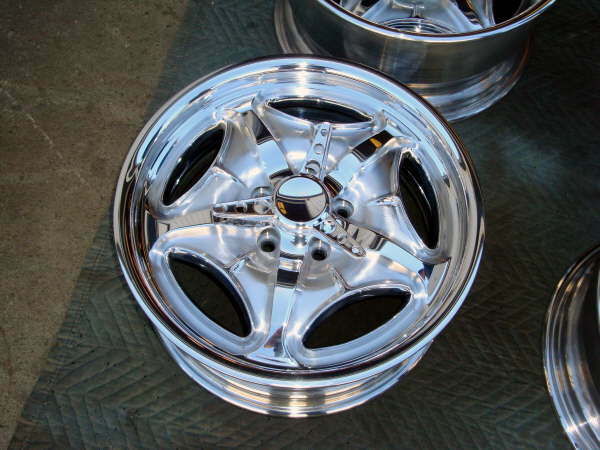 This look will be much cleaner. 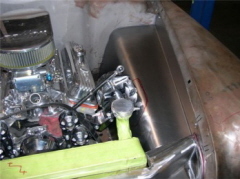 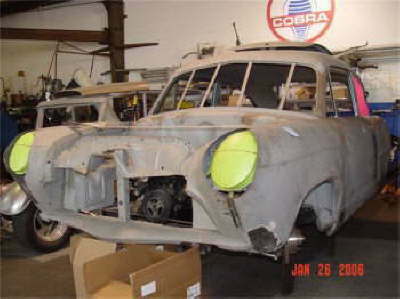 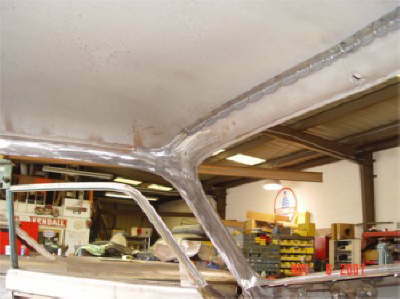 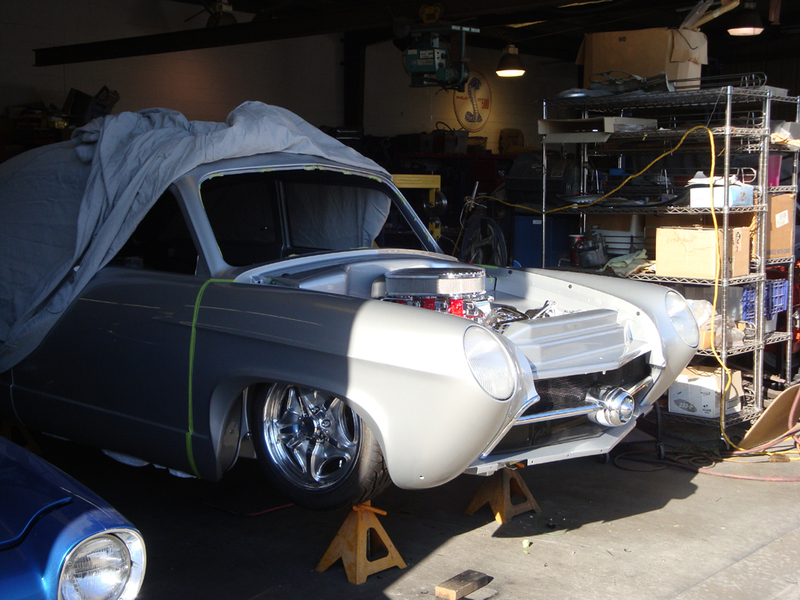 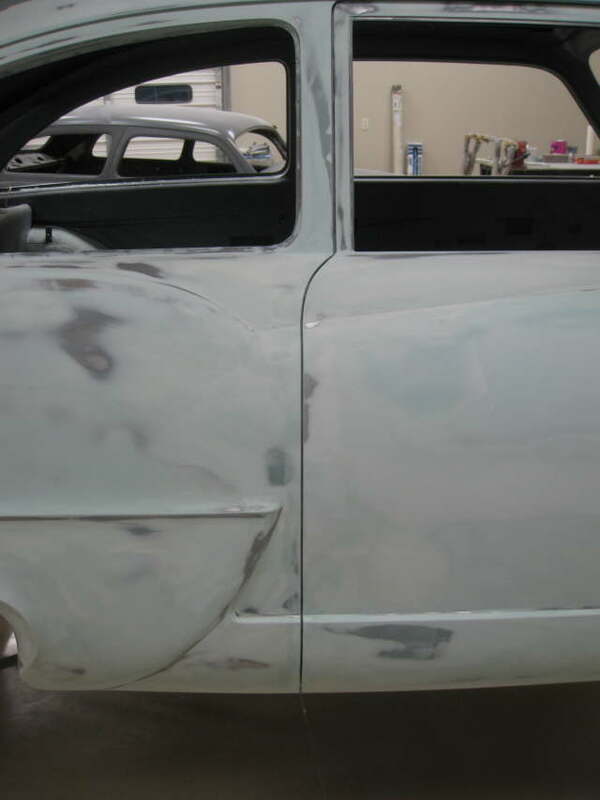 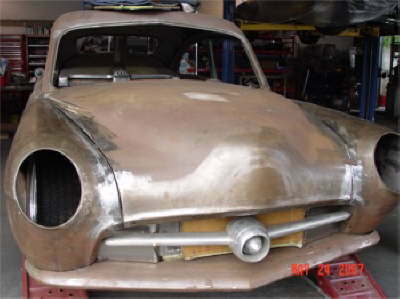 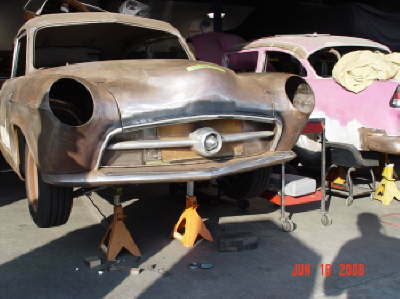 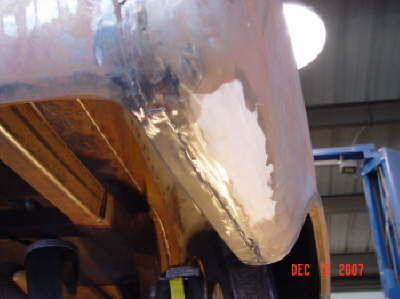 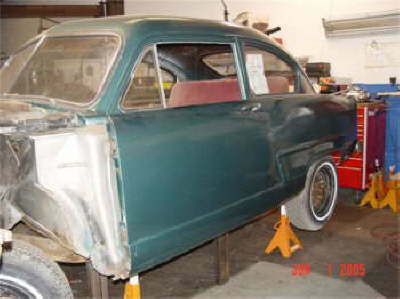 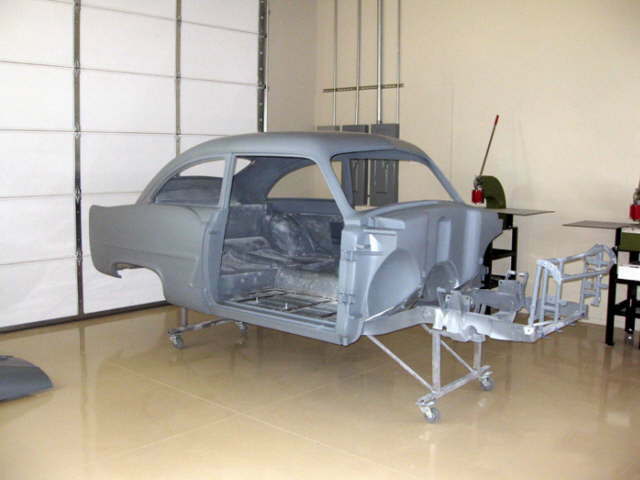 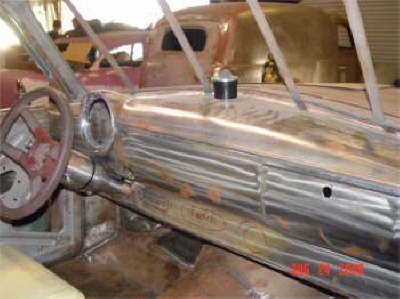 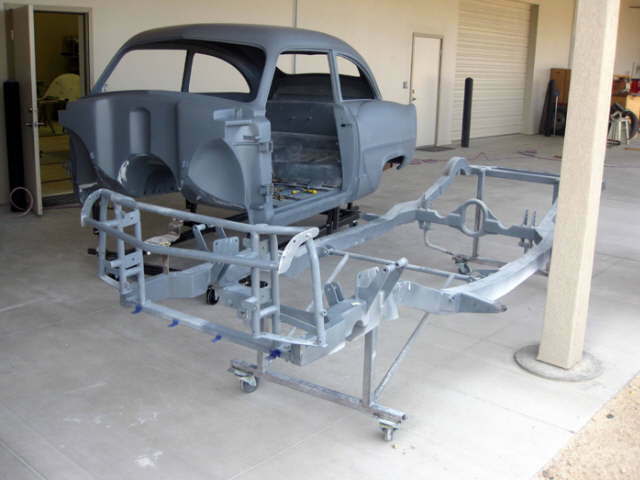 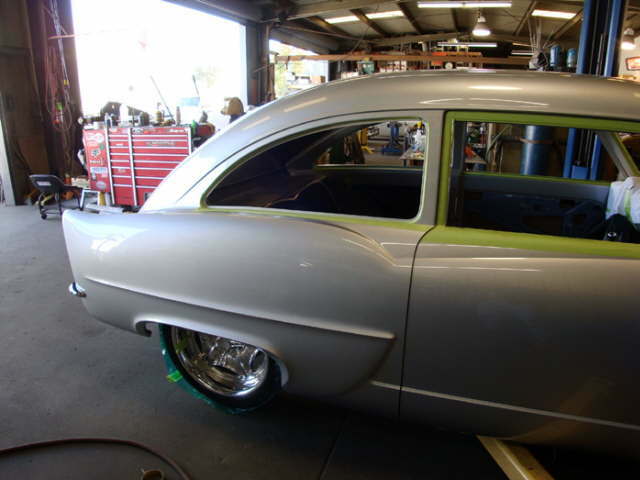 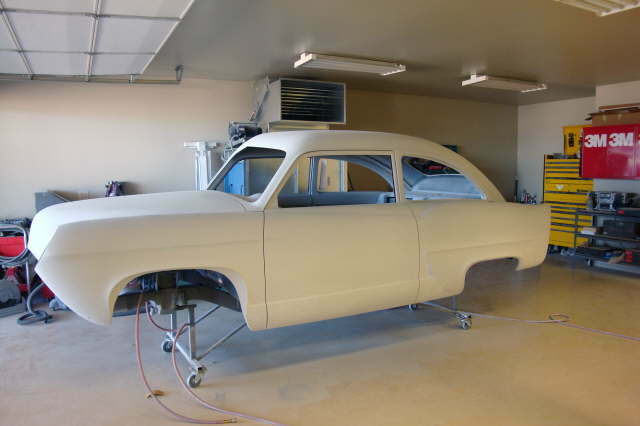 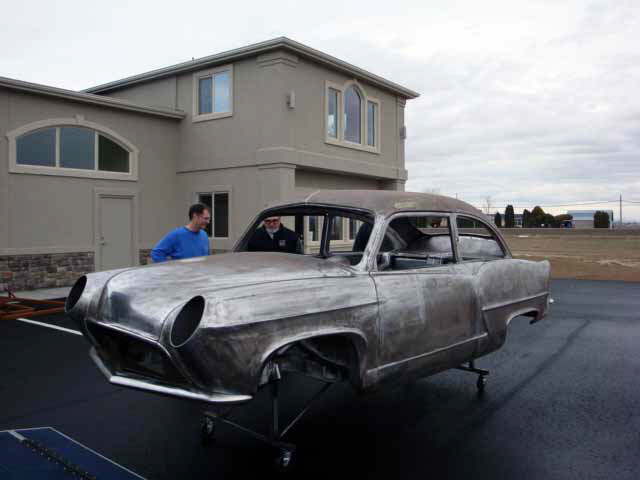 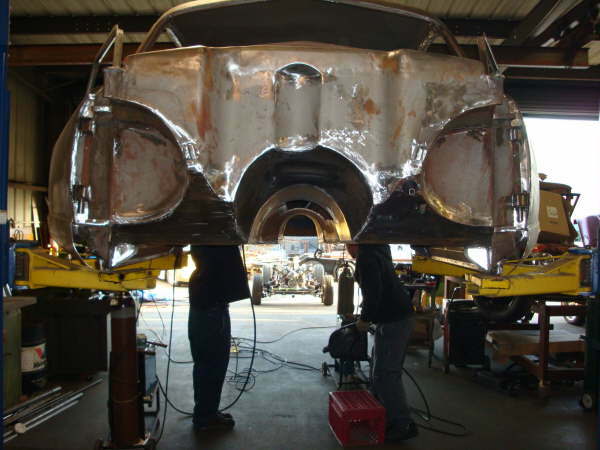 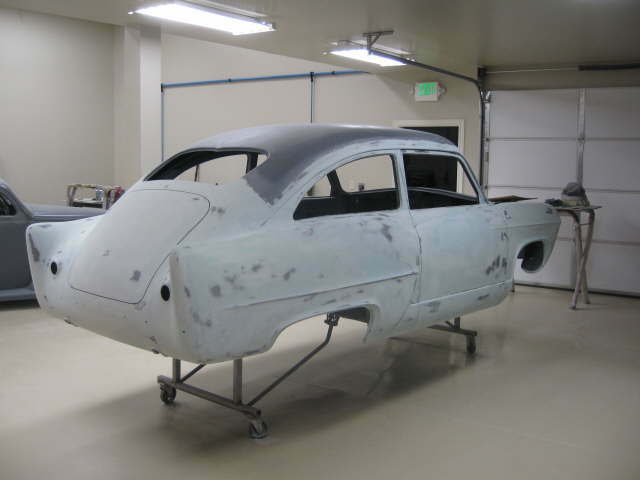 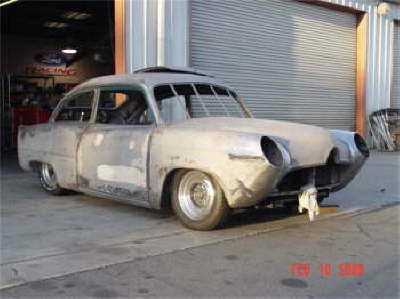 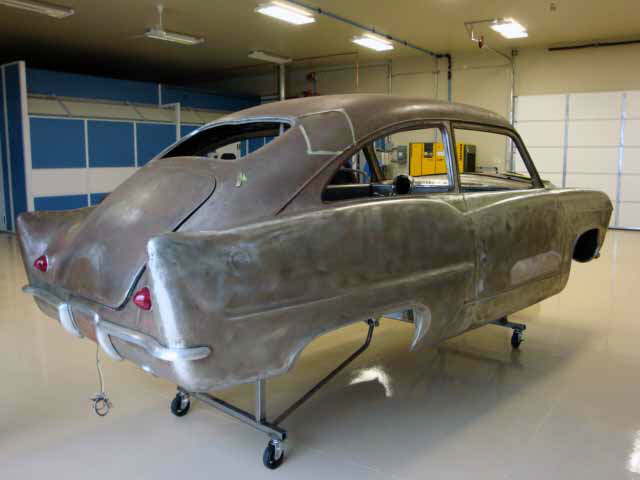 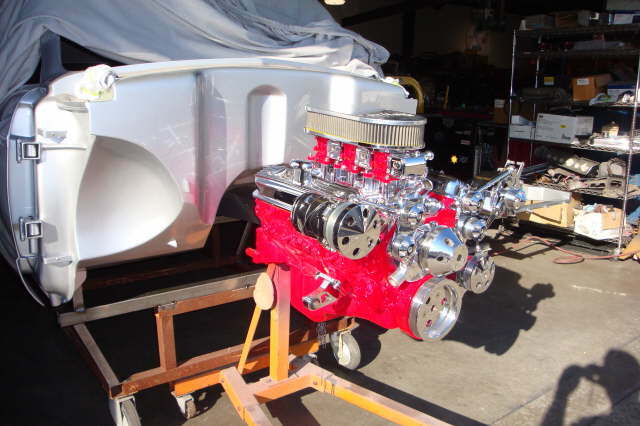 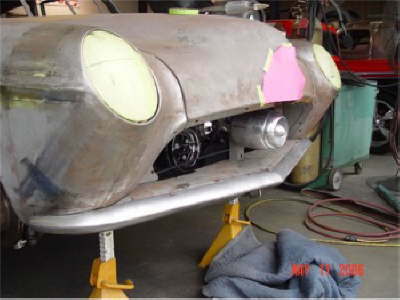 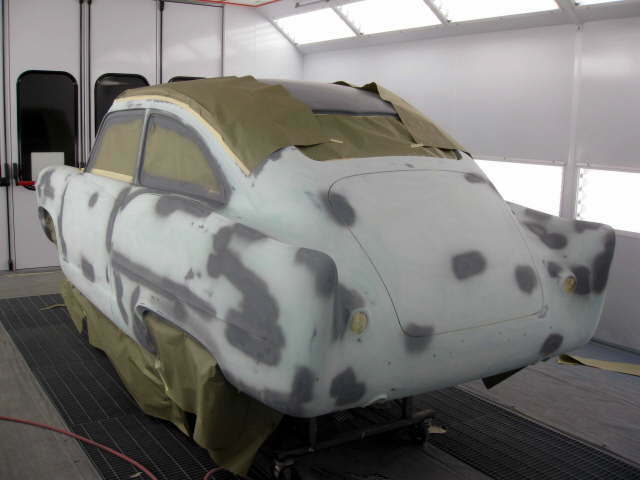 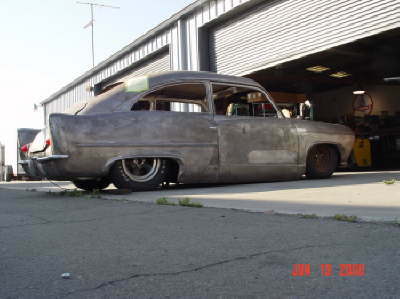 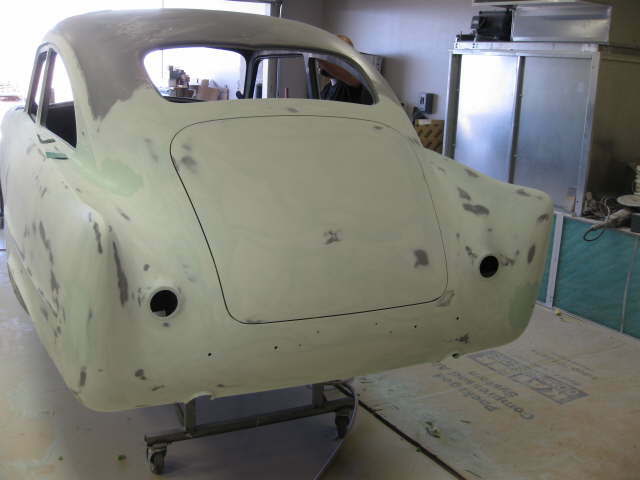 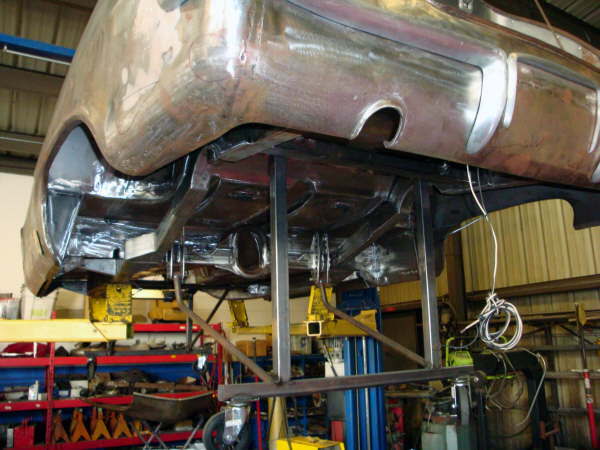 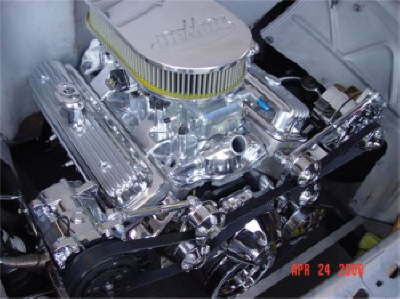 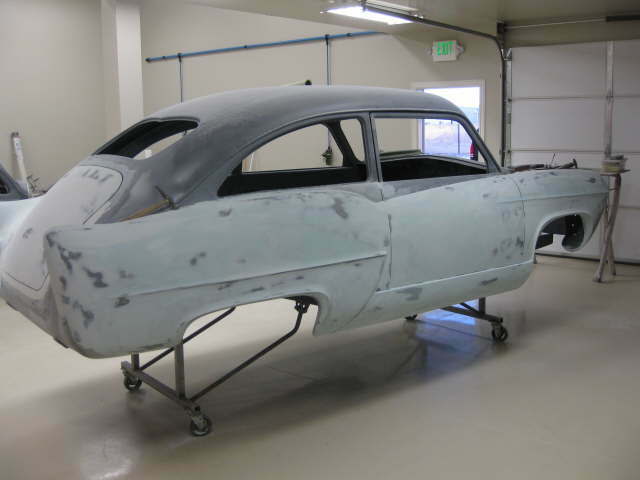 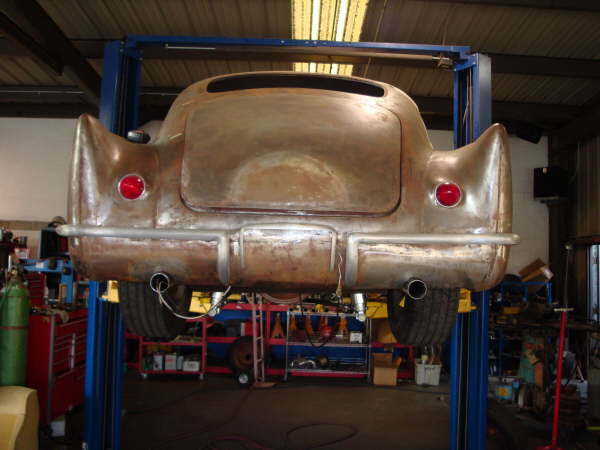 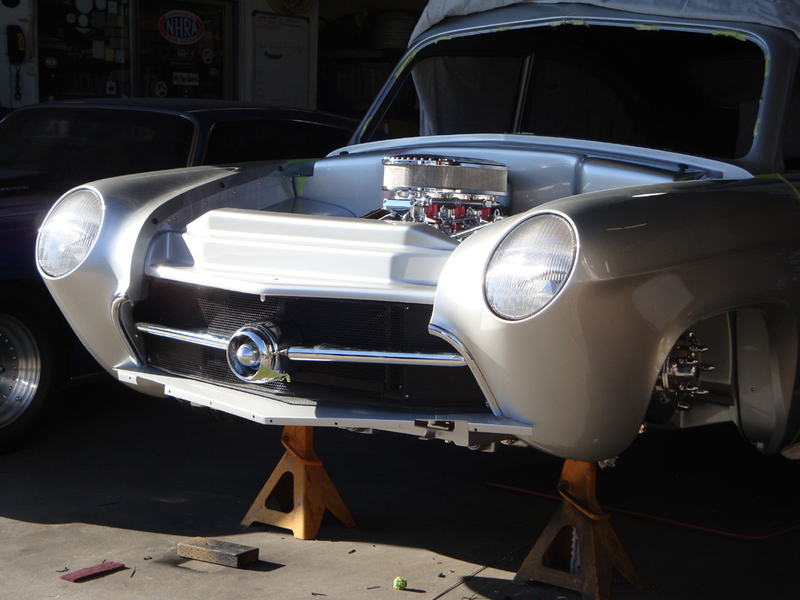 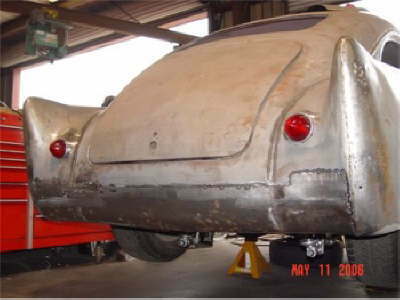 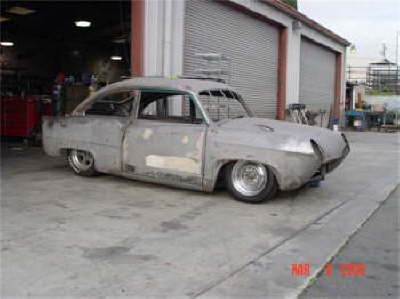 March 24, 2009 Update: recently dropped the car off at Charlie Hutton’s shop in Nampa Idaho for prep & painting. 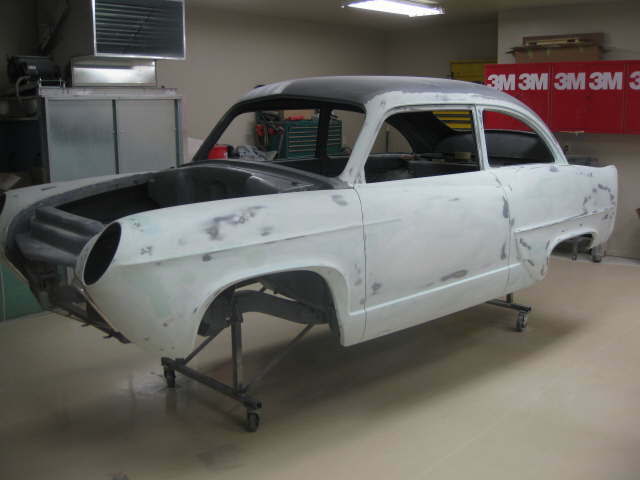 Hopefully will be ready in about 3 months. 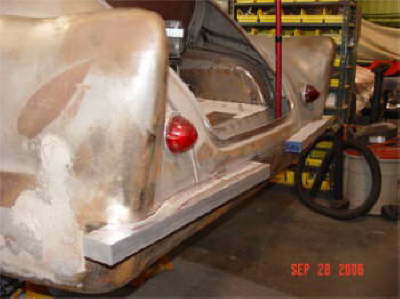 Update: June 26, 2009-Pictures of latest work being done at Charley Huttons. 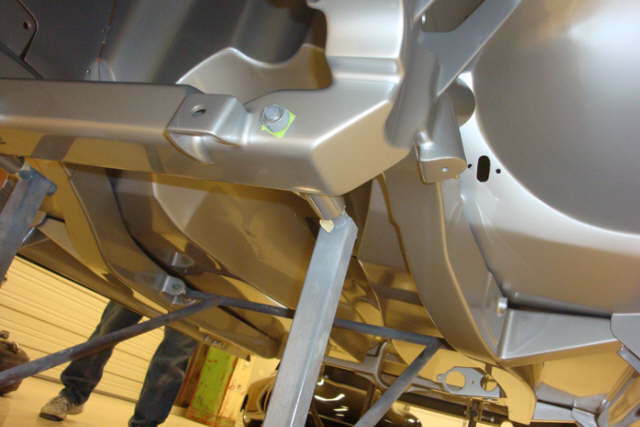 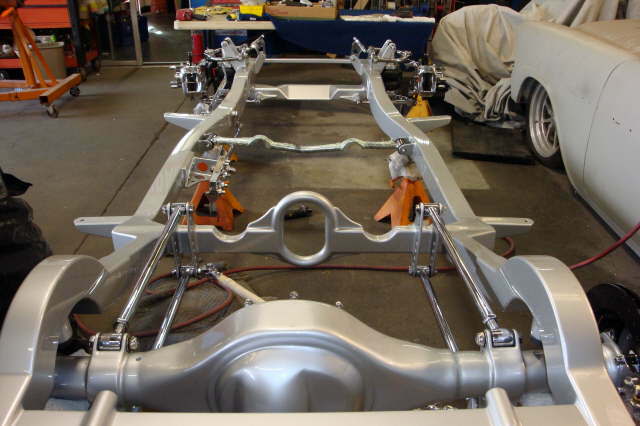 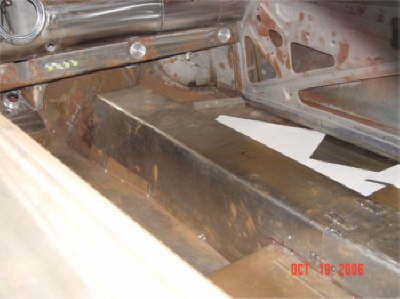 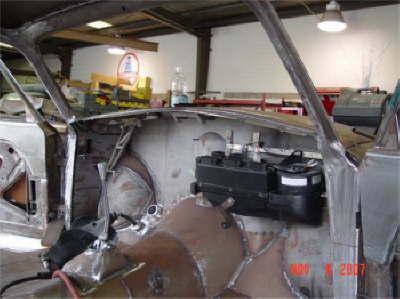 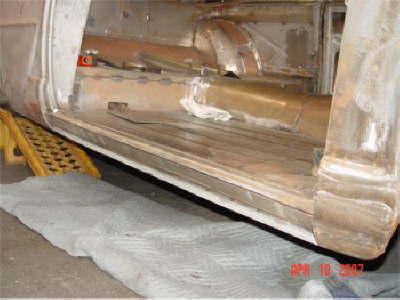 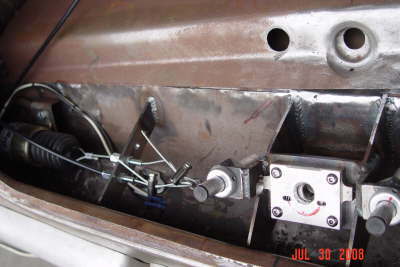 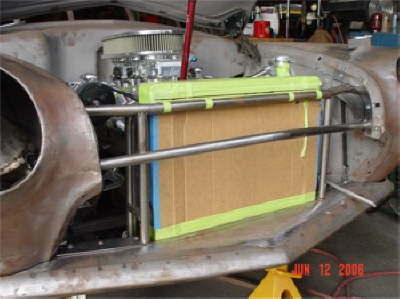 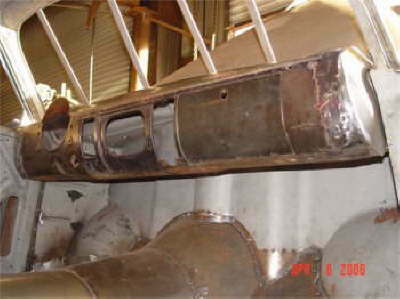 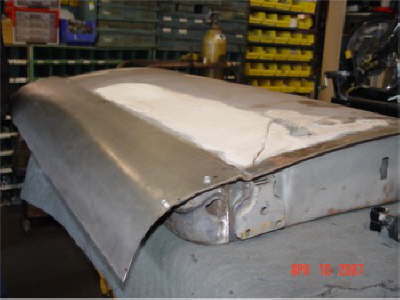 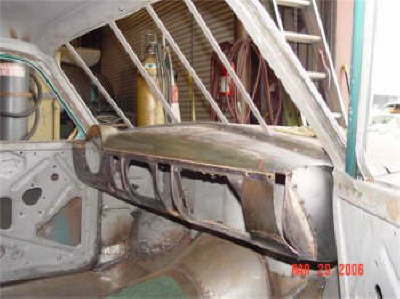 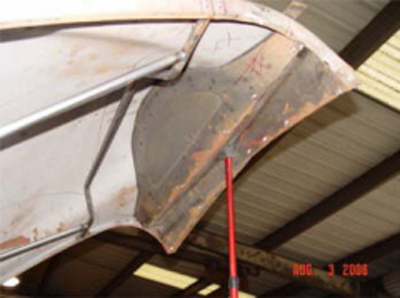 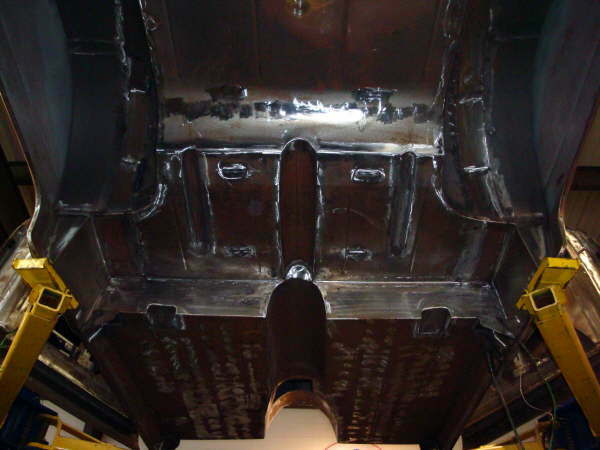 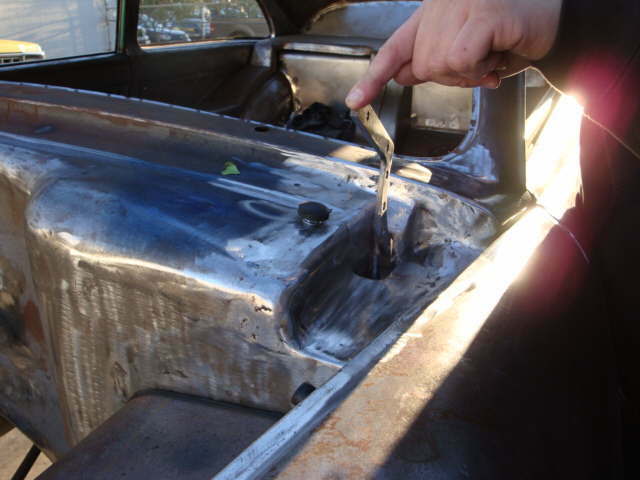 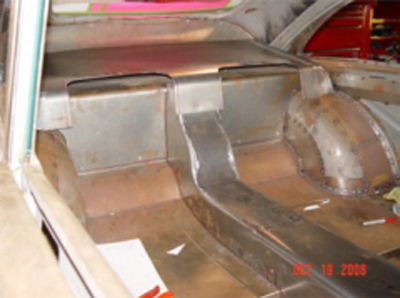 Rear package tray area, rear roll pan area, and spot prime body. 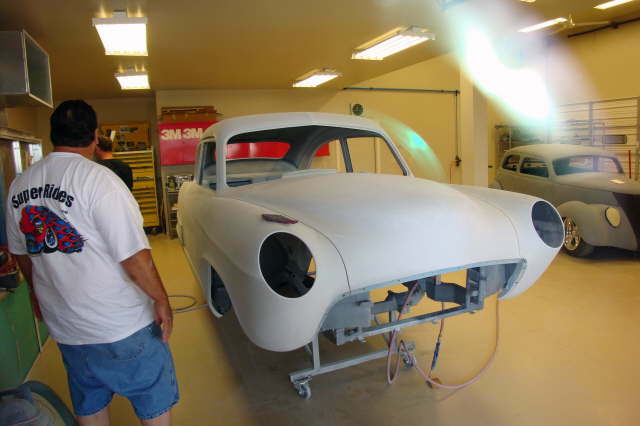 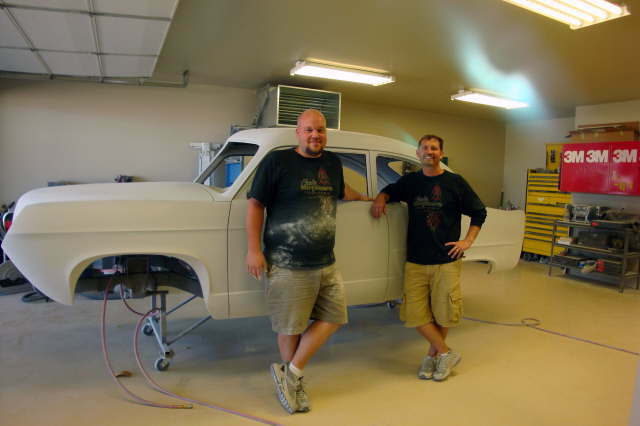 Update: Aug. 10, 2009 -Took a trip up to Nampa Idaho to check on the car, at Charley Hutton’s Color Studio. 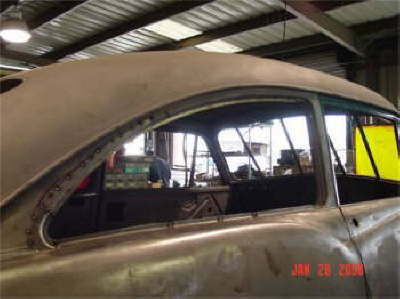 Here are a few pics of the progress. 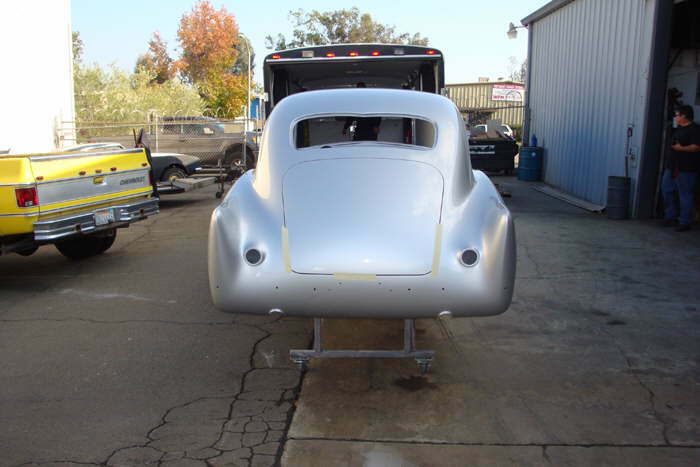 It should be finish painted in the month of August and ready to bring back to Ca. 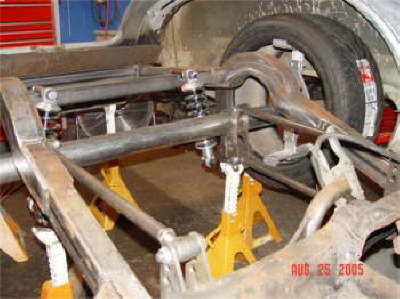 in September. 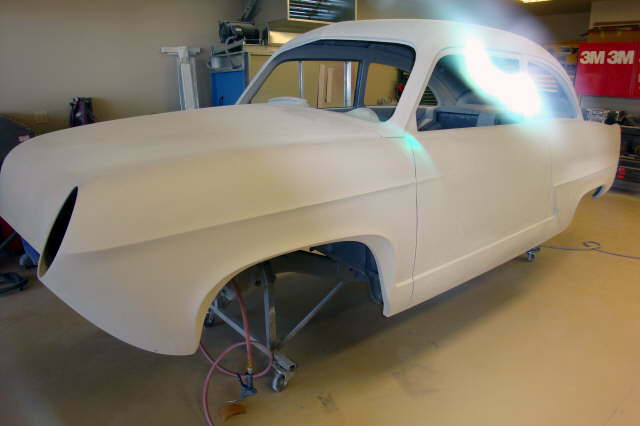 The work done so far is absolute perfection as far as I can tell. 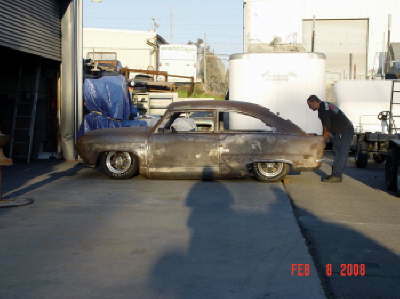 Update: Dec. 7, 2009 - I recently picked up the car from Charley Hutton’s place in Nampa Idaho. 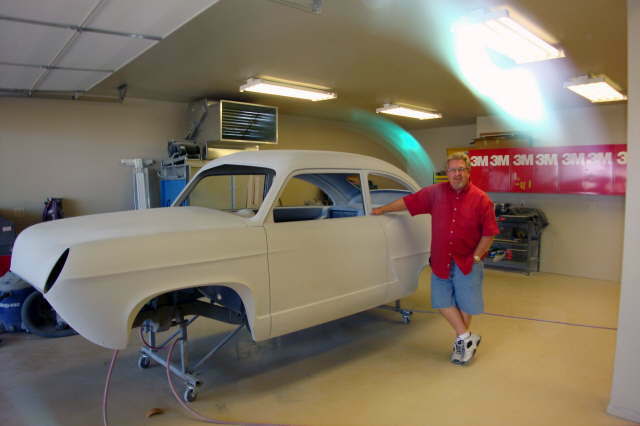 Here are a few pics of it now that the painting and body work is complete. 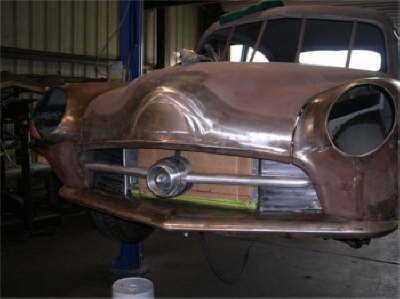 It looks fantastic I think. 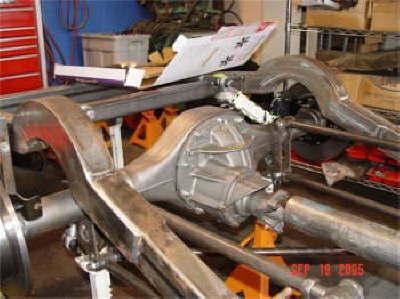 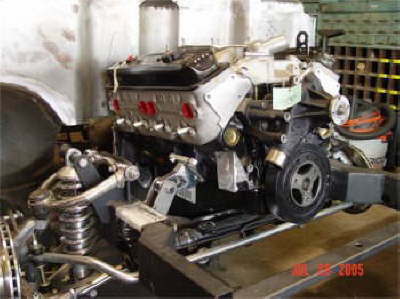 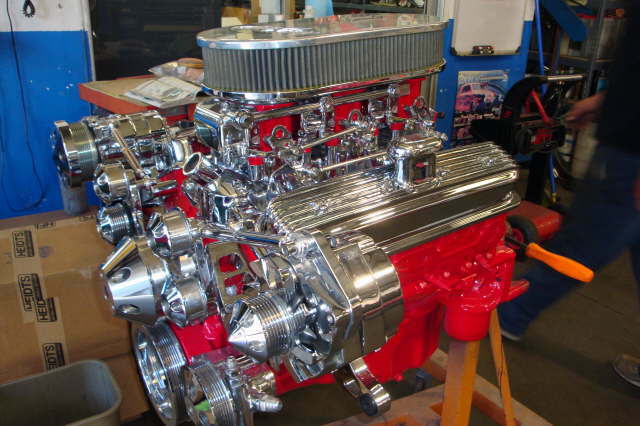 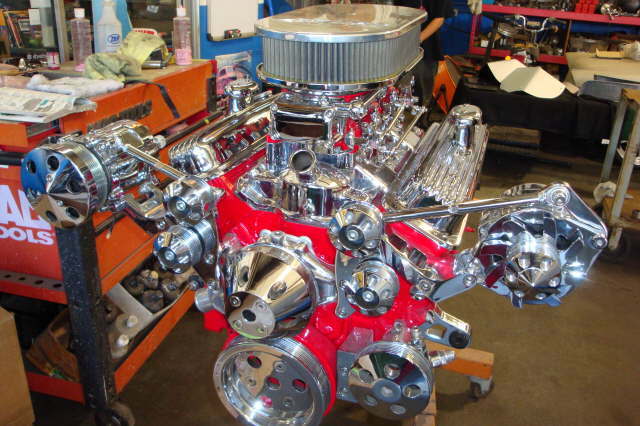 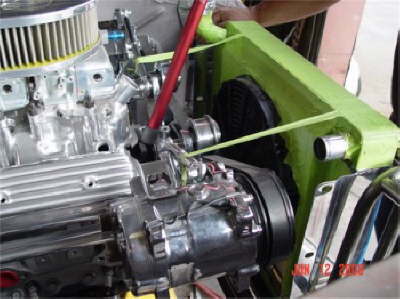 Update Aug. 2010 - The engine is almost ready to install into the frame. 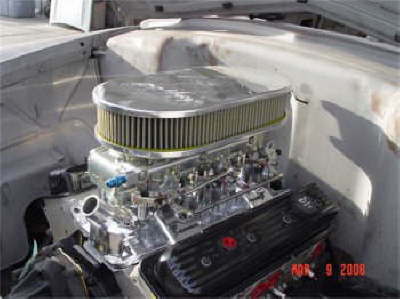 Waiting for the oil pan and some misc. 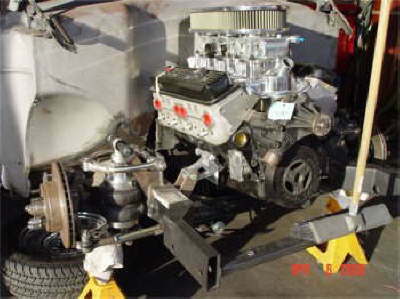 parts for the trans. 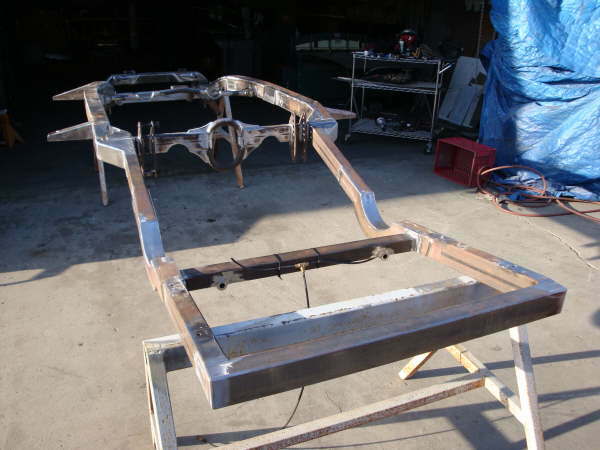 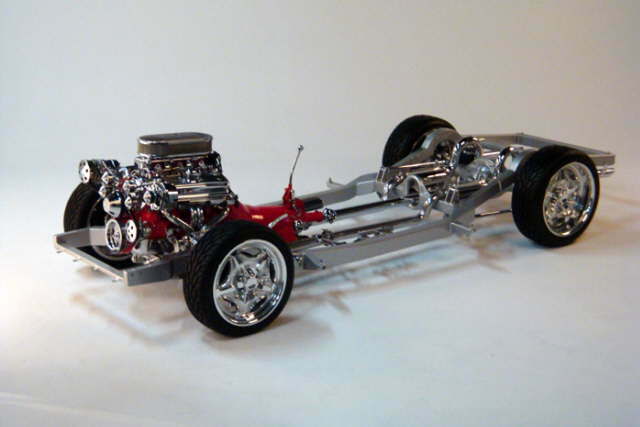 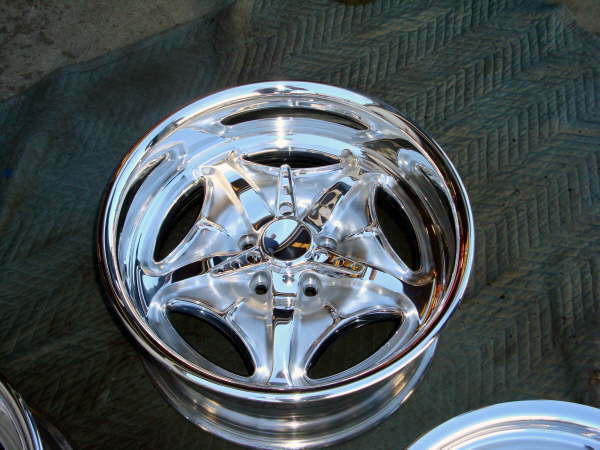 to come back from chrome plating. 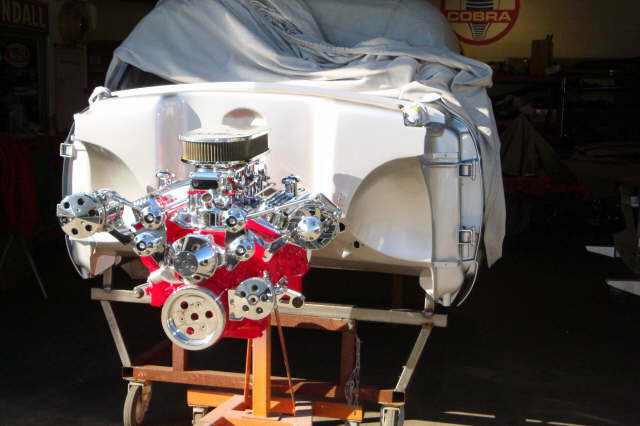 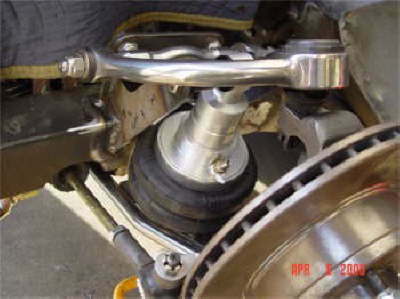 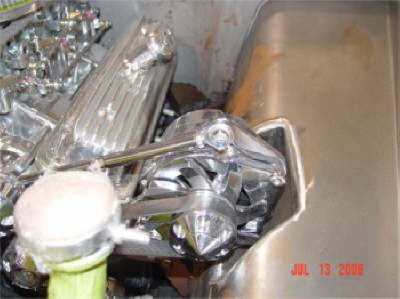 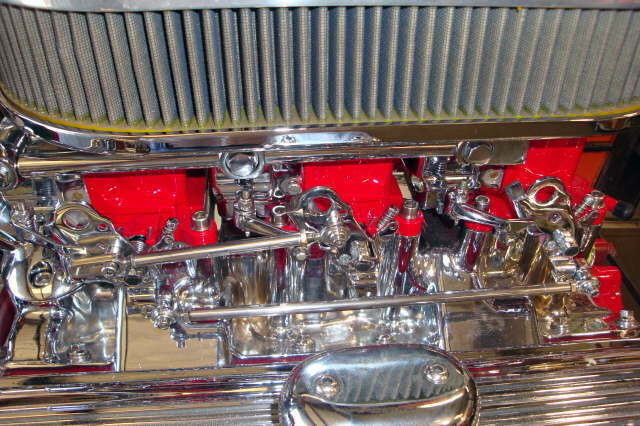 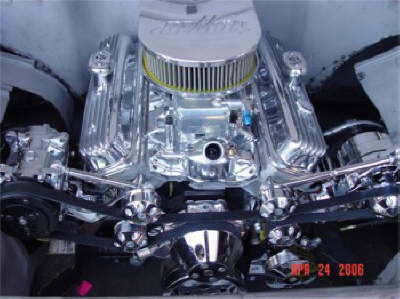 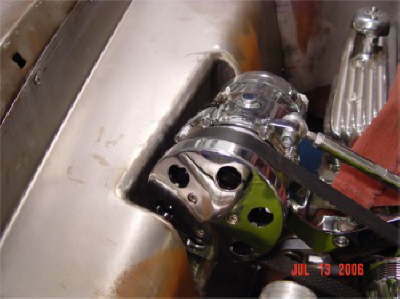 Note: all the carb linkage is chromed as well. 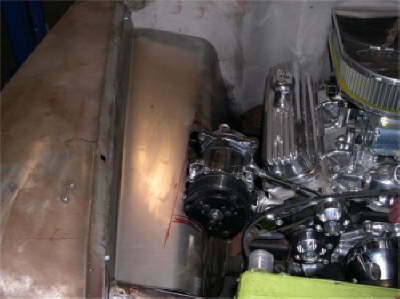 All three carbs had to be taken completely apart and re- assembled after the portions that could be chrome plated were plated. 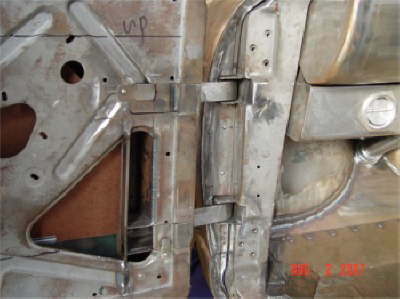 Some part could not be plated but we plated all those that could be. 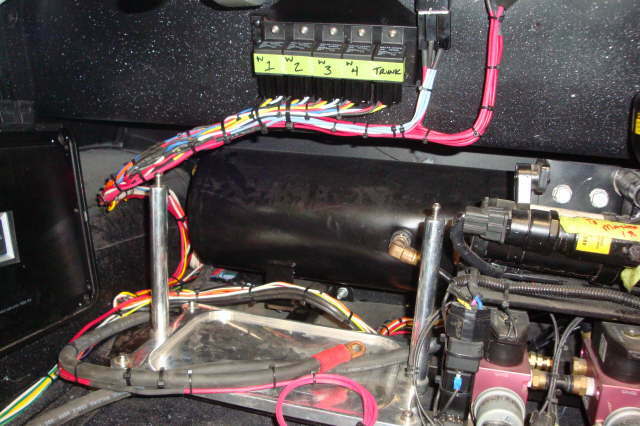 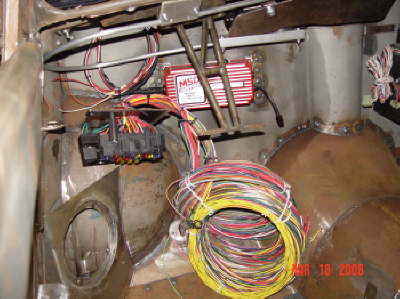 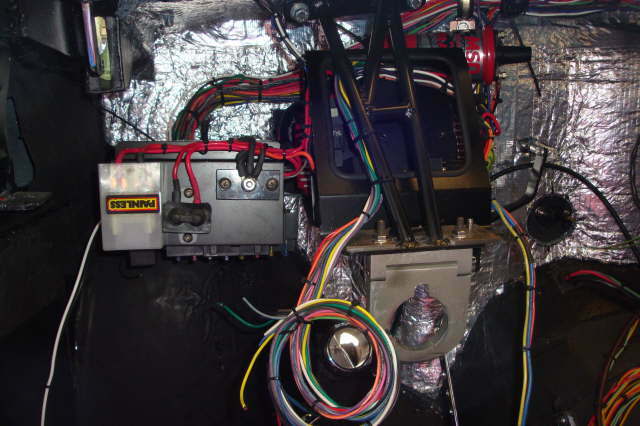 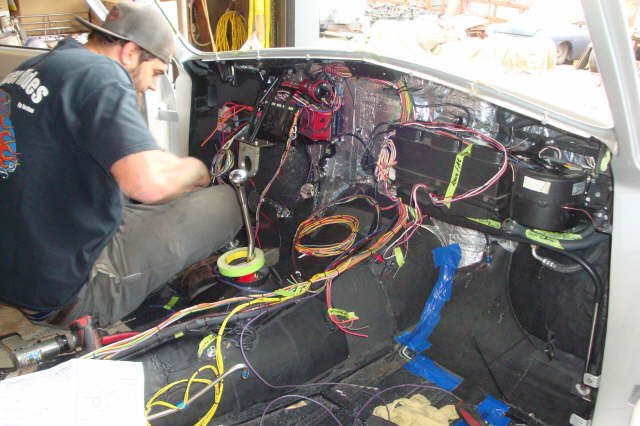 Here are some pictures of the wiring work being done. 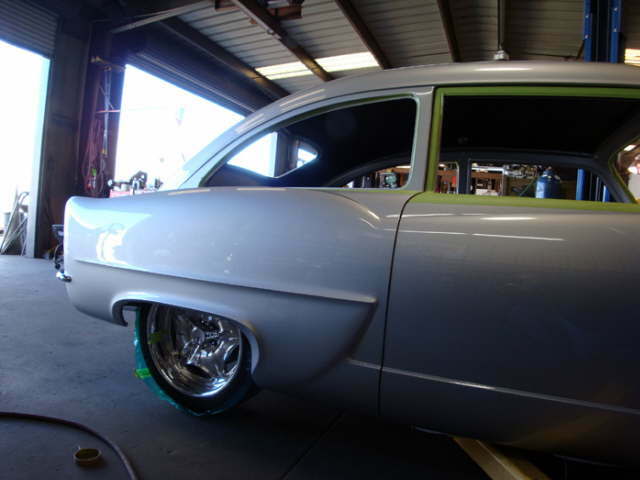 Car is close to finishing.